British Columbia, Canada is vast and diverse. So vast that there are areas one doesn’t even think to visit. Central BC is one of those places. One may ask with all the options for road trips why would one go to a place that is so remote? Let me tell you why. 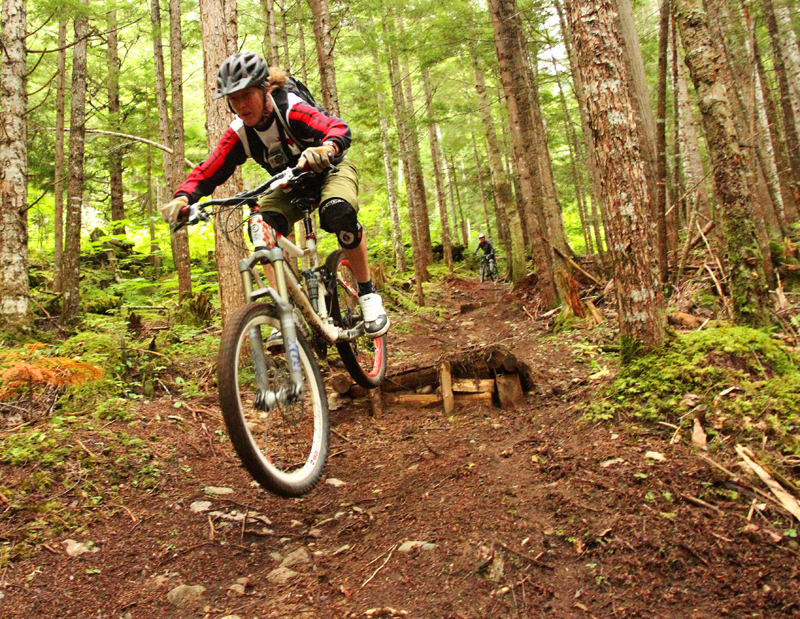 The trails are in great shape, due to the young and active mountain bike communities in the small towns the options and variety of trails is continually growing. Not to mention with the small town hospitality you will have a vacation to remember. This area should be on your list of places to visit. 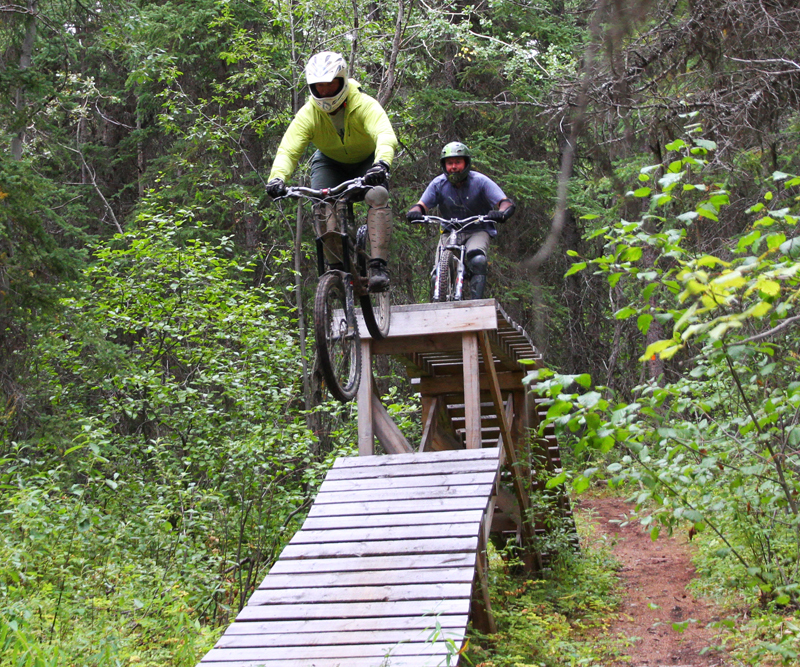 Our trip consisted of riding in Smithers, Burns Lake and Terrace. 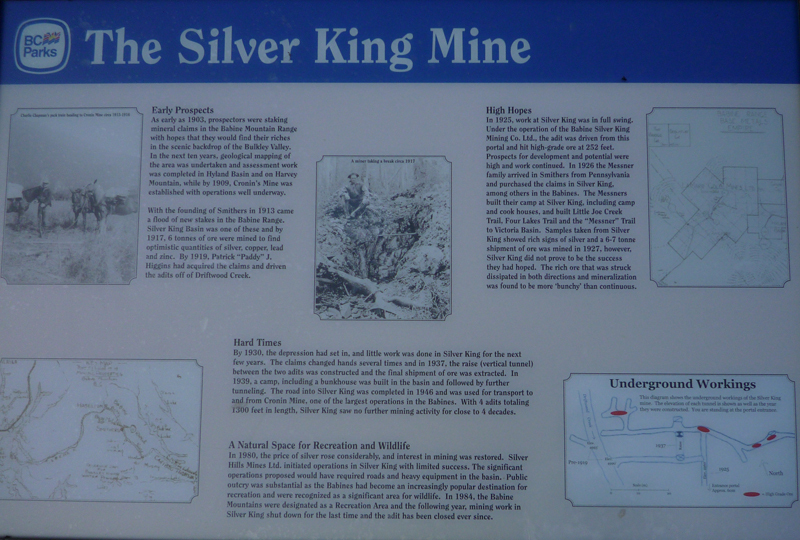 Central BC has a history of logging and mining. 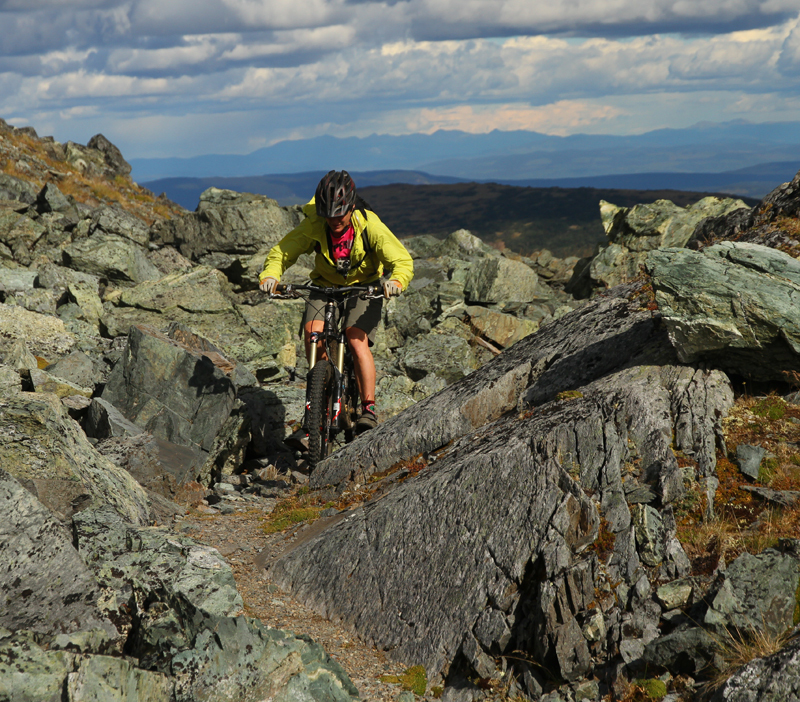 These industries have created access to vast areas where trails have popped up. 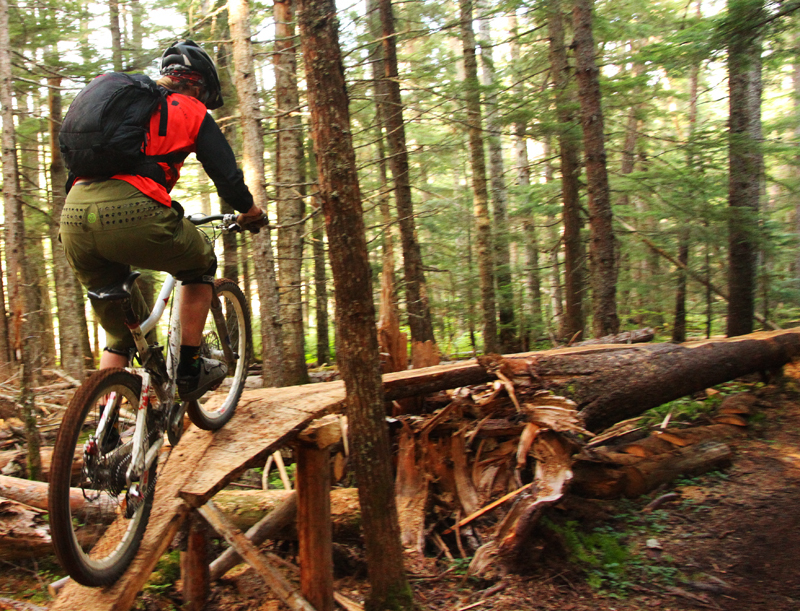 These industries have also created out of work loggers that find the time to work on trails. As well, grants have become available to stimulate these towns by creating trails and other tourism opportunities to create jobs and bring people into these areas. 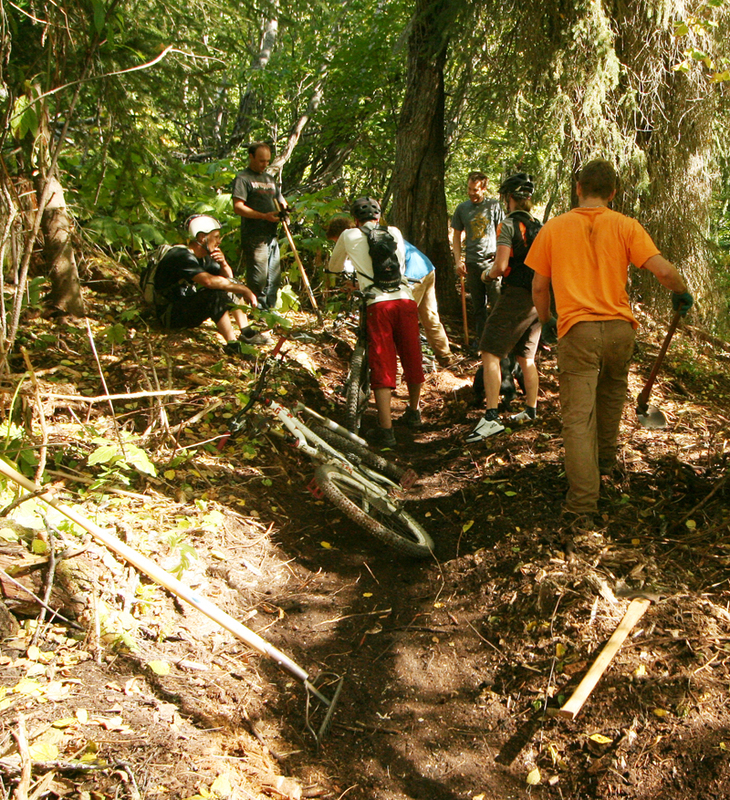 Now legitimate organizations are being created to build more trails. 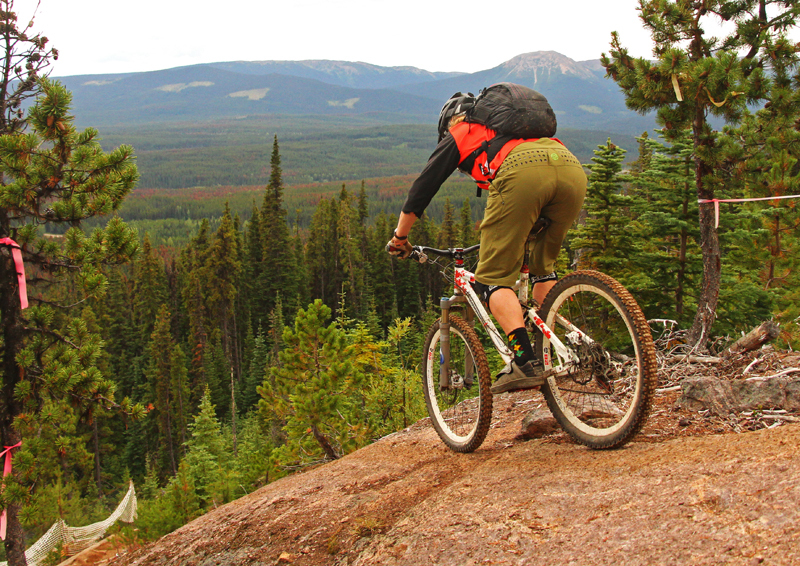 Organizations such as the Smithers Mountain Bike Association, Burns Lake Mountain Bike Association and the Terrace Off Road Cycling Association form to protect existing trails and work with the landowners to create more. 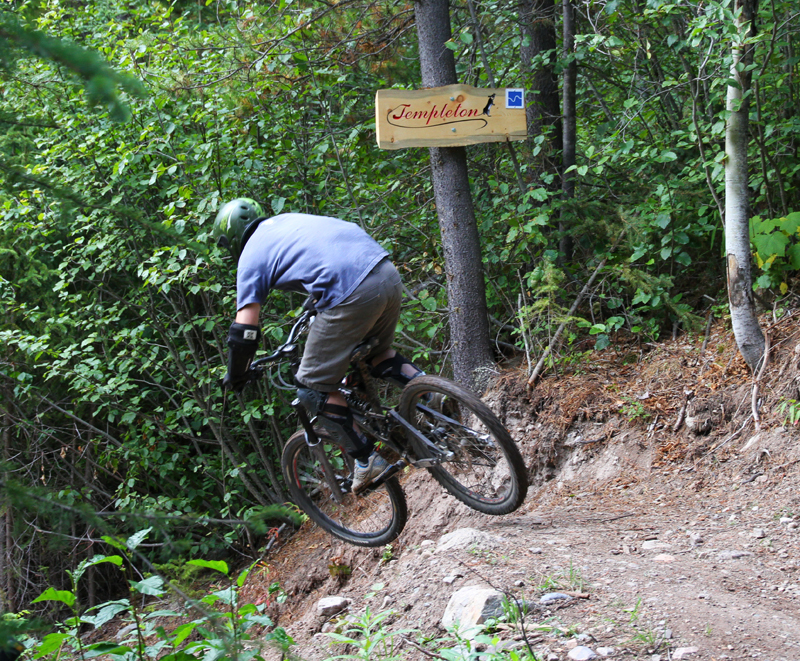 The trails in Central BC are a mix of old and new school. 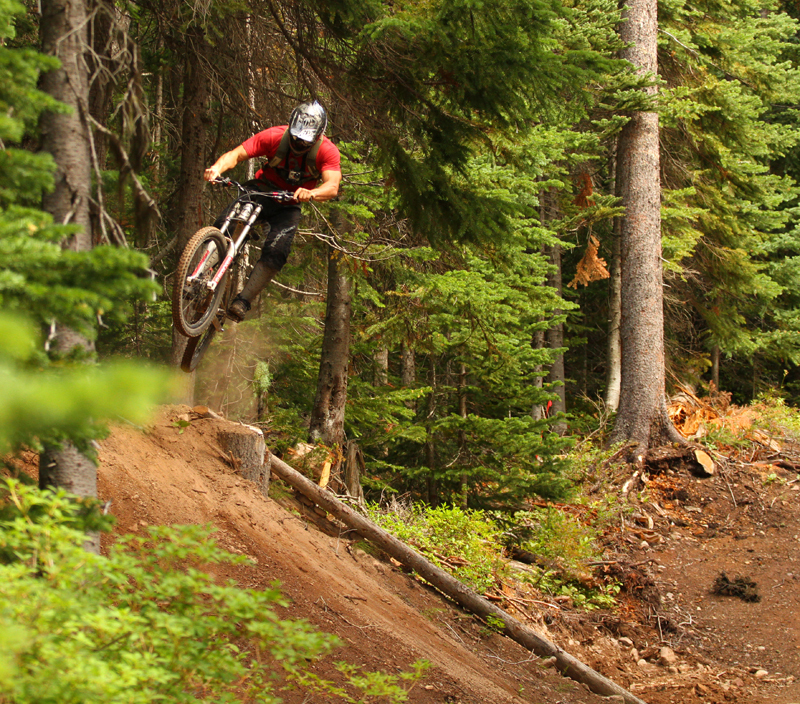 Established trails have some of the old school charm with some flowy sections and jumps mixed in. 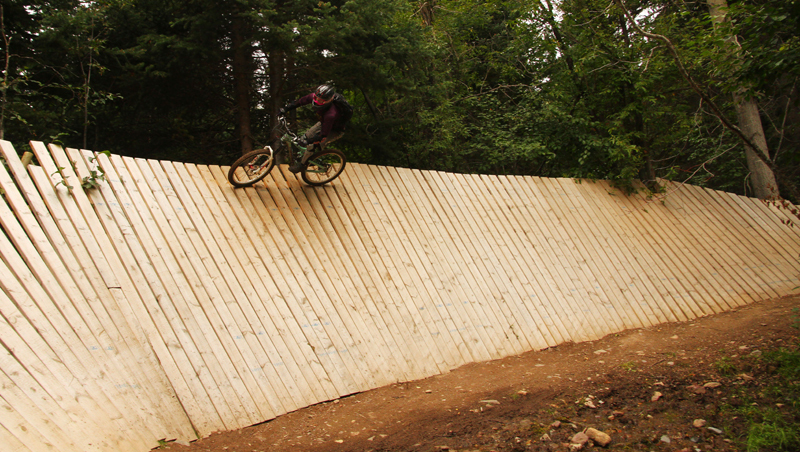 Many of the new trails are definitely new school with table tops, gaps and bigger jumps. 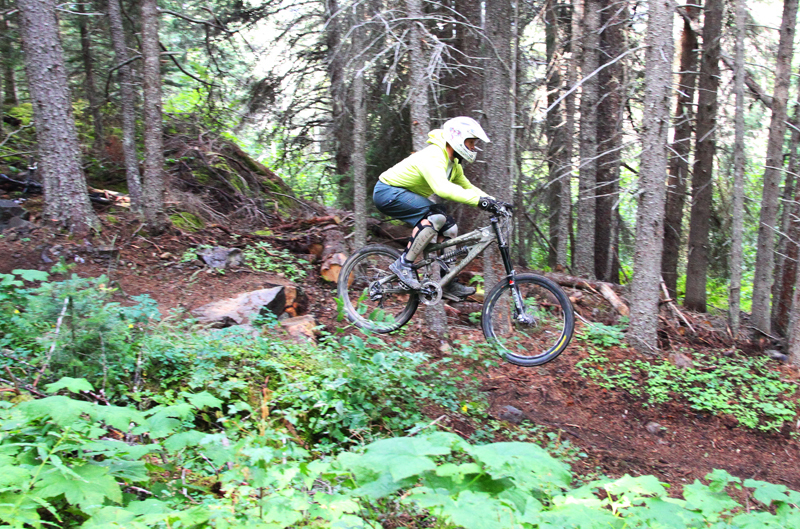 A big bike might be good on some of these trails, but most can be ridden on a 6X6 bike with good suspension and fatter tires. My Dad once came to this area to work. He mentioned to a local how beautiful this country is, the local replied – “Ya well what good is it?” Hopefully the story below will answer this question. On this trip we flew in via Hawk Air and rented a mountain bike appropriate vehicle. This was provided by National Car Rentals as a Ford F150. Our first morning we were treated to breakfast at the Silvern Lake Trail B&B. 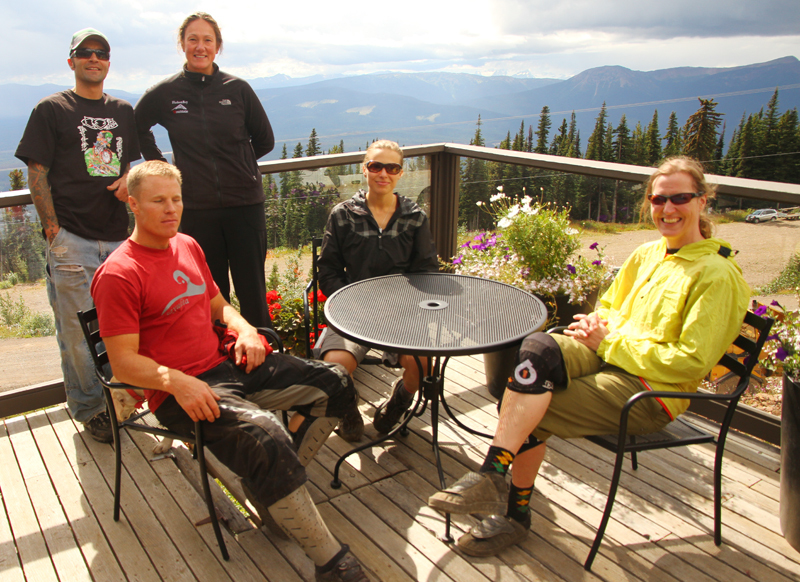 Michaela has been hosting recreationalists in the Smithers area for the last 20 years! Her food and enthusiasm will keep you going all day. We sent our bikes to C.O.B. 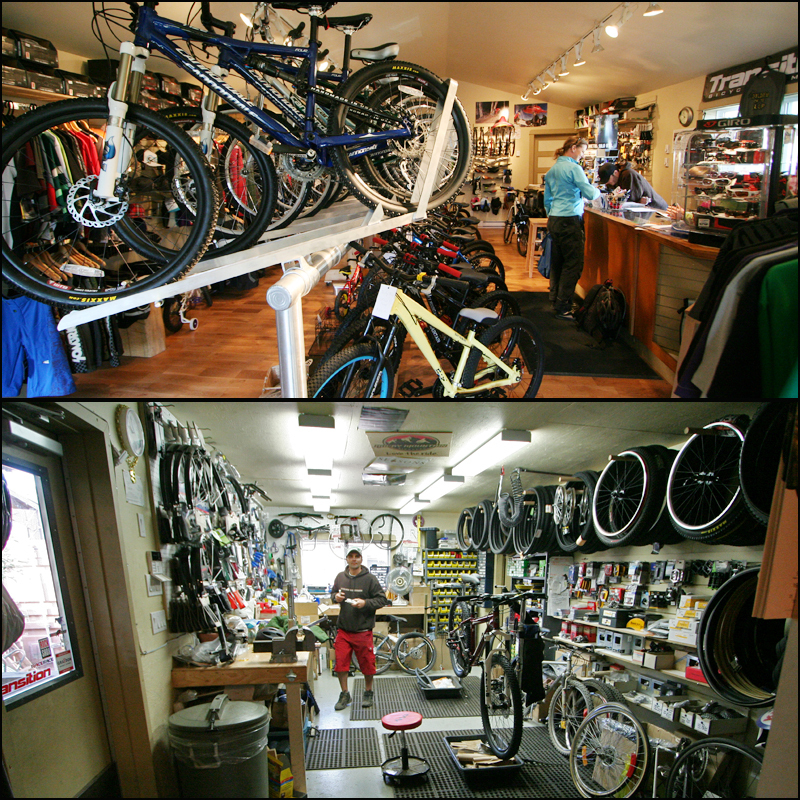 Bike Shop. C.O.B. stands for Children of the Bluff. 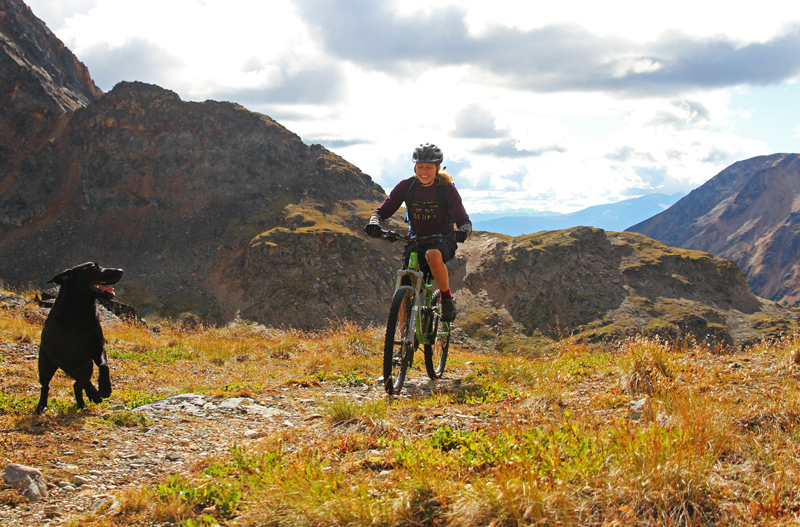 The Bluff is the area where mountain biking started in Smithers. 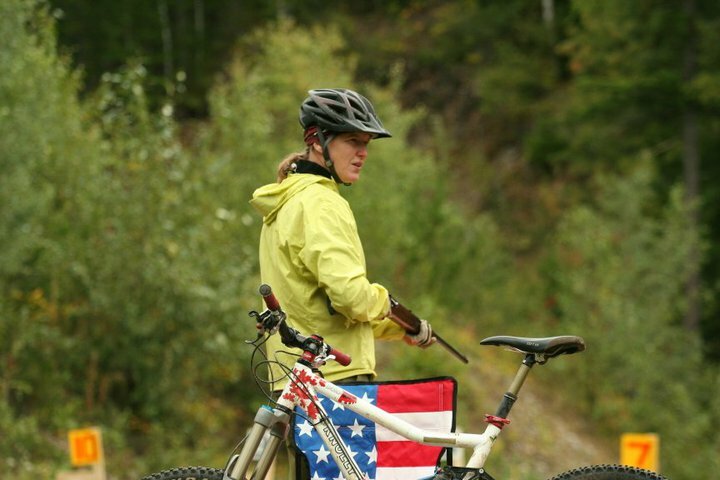 Dave Percy is one of the original mountain bikers and builders in the area. 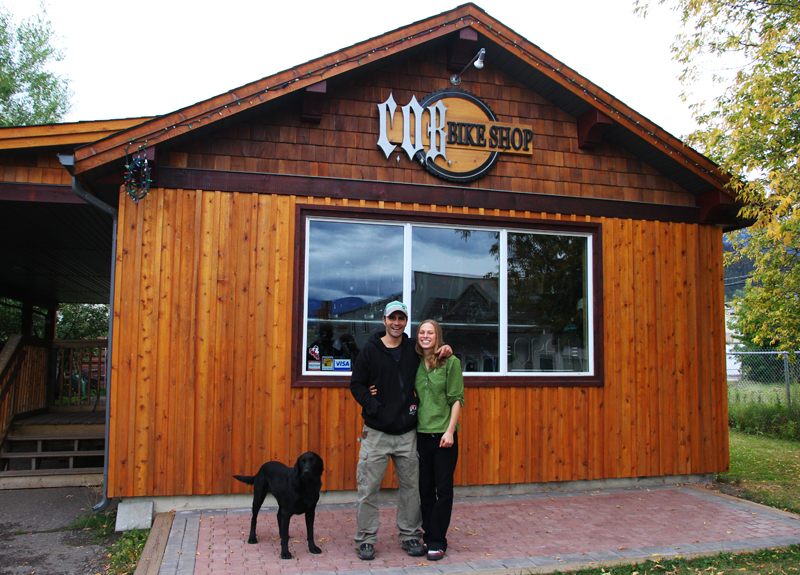 He now runs a bike shop and supports the growing mountain bike community. 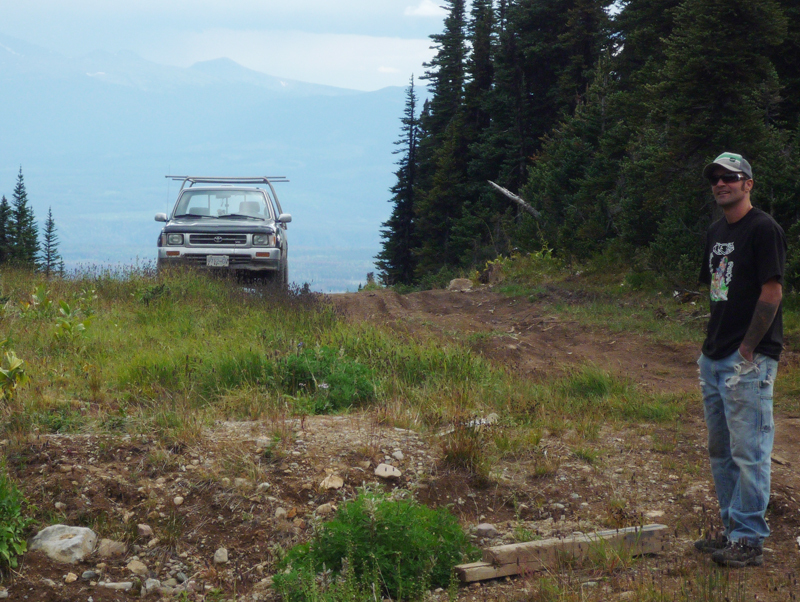 One may not know but there is a mountain range north of Smithers called the Babines. 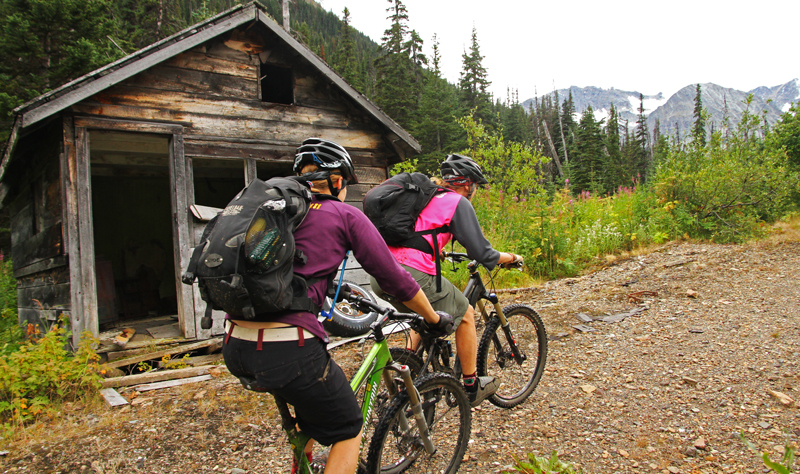 This is an area with a rich Silver mining history which is now a BC Park and hosts many trails into the Alpine. 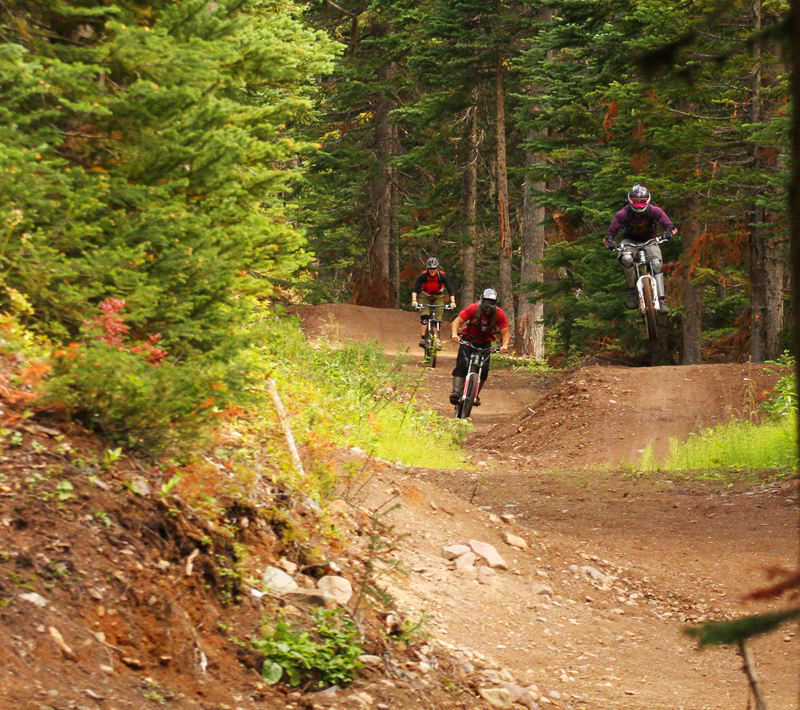 One that you can ride is the Cronin Pass trail. Stay right! Gabe Newman, the other owner of COB Bikes and partner in life to Dave, was our guide for this ride. Heading up the old mining road. Many old relics of the past are along the route. Into the alpine we ride with Omar watching over us. Some steep parts require a walk to gain elevation. Even though in this area Alpine is at 1800m. 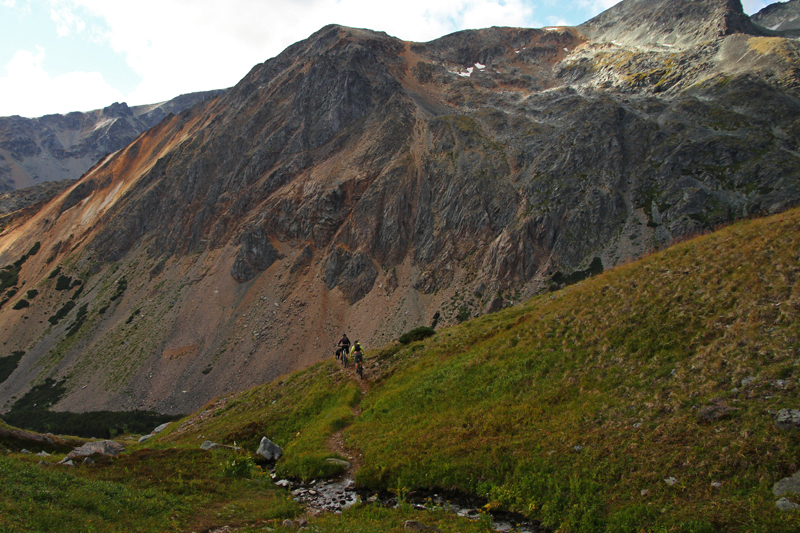 Heading down into Silver King Basin. 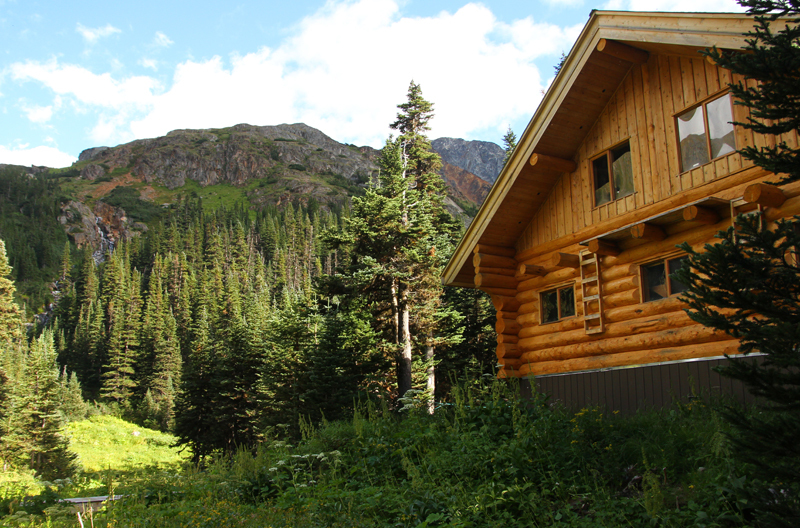 We arrive at the Joe L’orsa cabin, named after one of proponents of making this area a Park. Silver King Basin behind us. We came from picture right. It was time to check out some of the local trails. 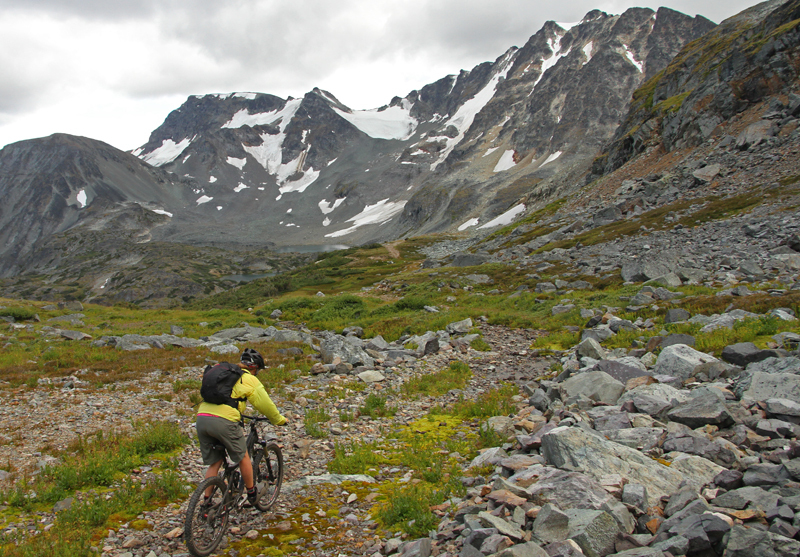 In the Ptarmigan system is a new trail – Hucken Eh. 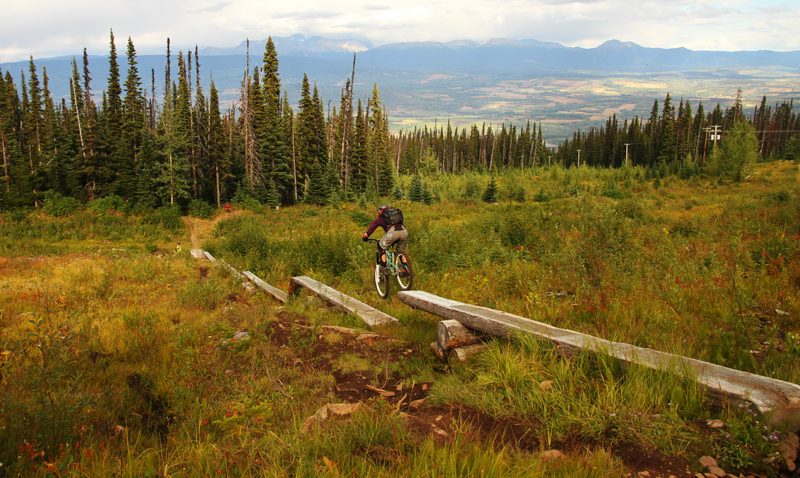 Hucken Eh is a purpose built downhill-only mountain bike trail in Smithers BC built with a combination of grant-funding and volunteer hours. 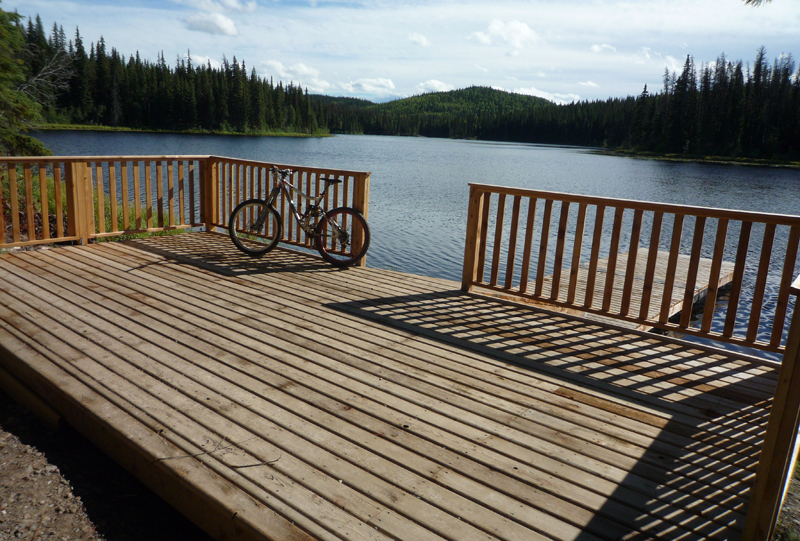 It is accessible off the Hudson Bay Mountain road as a shuttle or pedal up. It is 2.65km long and drops 277meters. Our guides were Brian Shorter (who’s company built the trail) and Gabe. 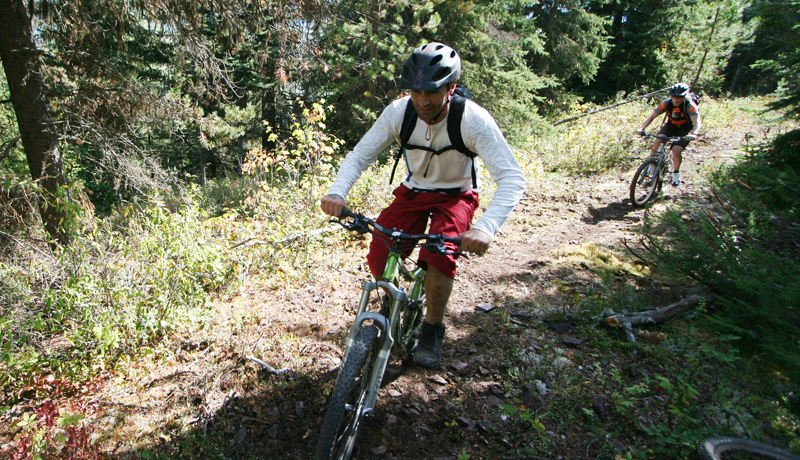 Contact COB Bike Shop or the SMBA for more information about the trail status and location or check the article on pinkbike.com about biking in Smithers for GPS. 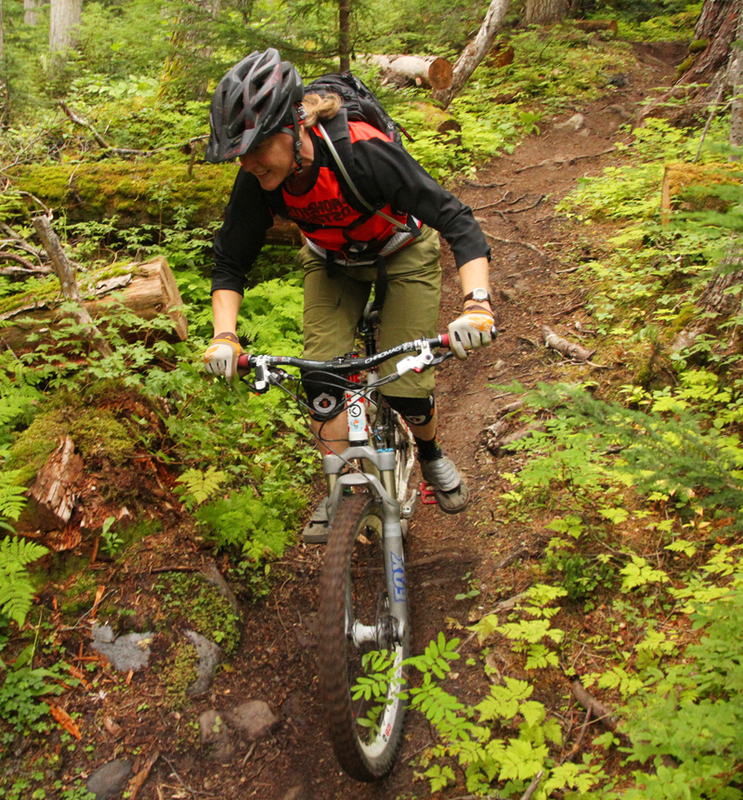 Off Mt Hudson Bay ski area is a new trail called Pay Dirt. 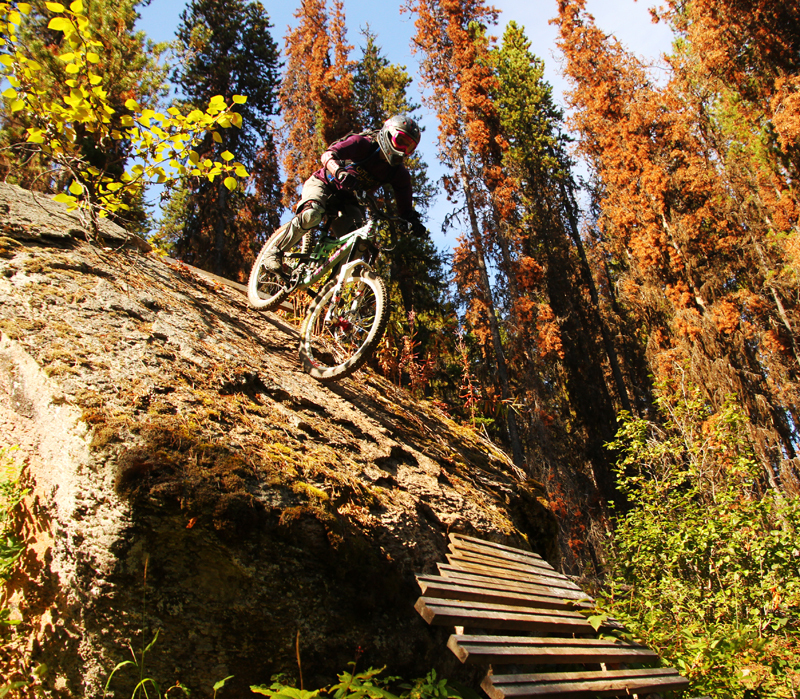 This was built by Brian’s crew along an old abandoned road that was 4.2km long and drops 490m. This is a trail modeled after A line – consisting of tables, gaps and jumps. Mt Hudsons Bay offers BBQ Lunches for July and August. This was a welcome addition to a day of shuttling! Also off Mt. Hudsons bay is the trail Piper Down. Named after a plane that crashed many years ago. This trail is 4km long and drops 575m. It is mostly natural but has some cool rock and jump features. 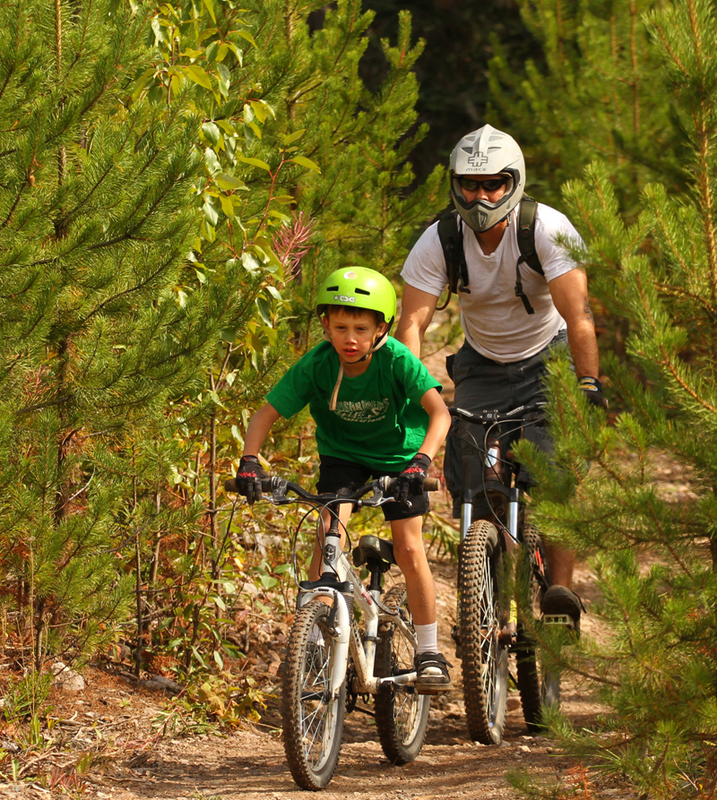 The trails are built to be enjoyed by all ages! 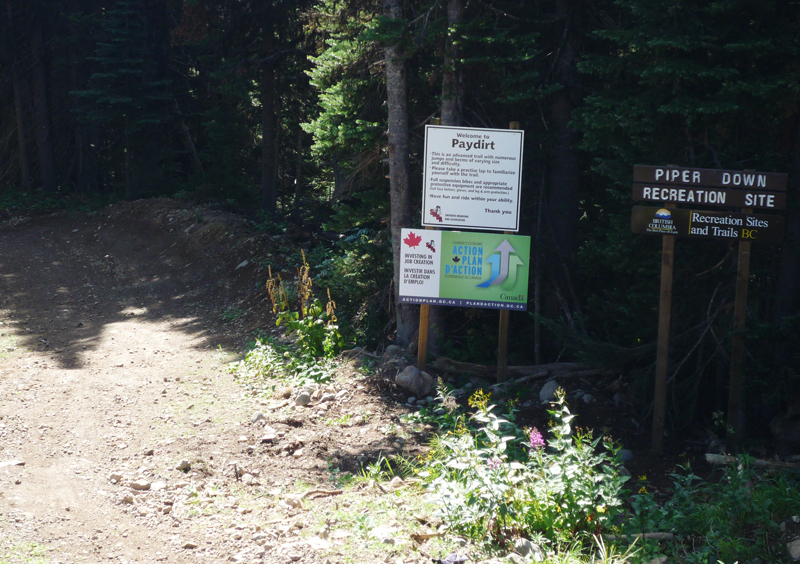 Further up the ski hill is another trail called Backdoor. 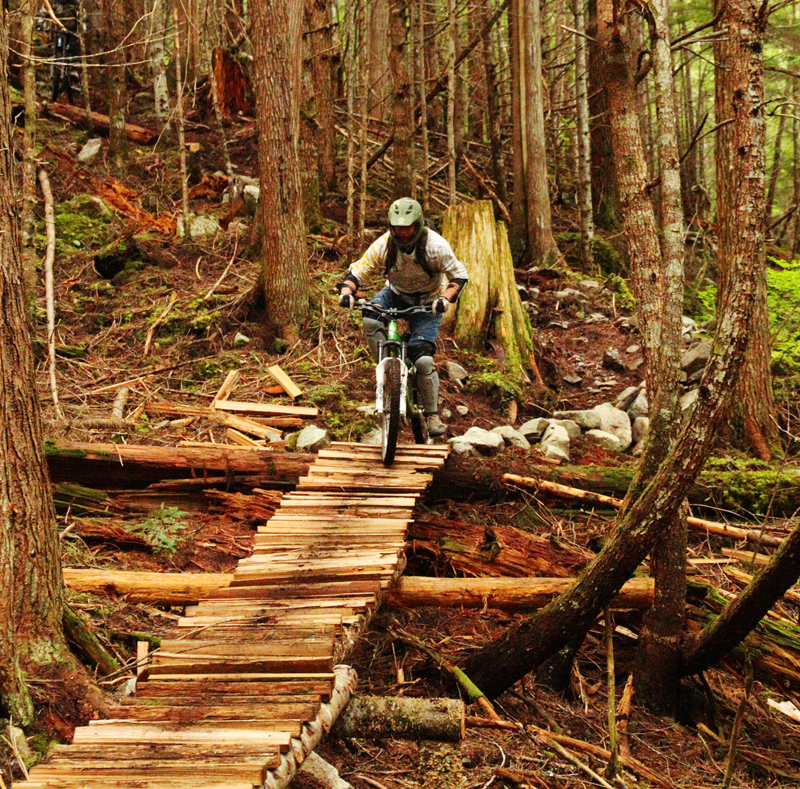 This trail is 6.25km long and drops 1000m back to Smithers. Not to be ridden in really wet conditions since this will destroy the trail and it will be very slick. This is a must do ride off Mt. Hudsons Bay. The next day we were off for some crosscountry riding in the Bluffs. 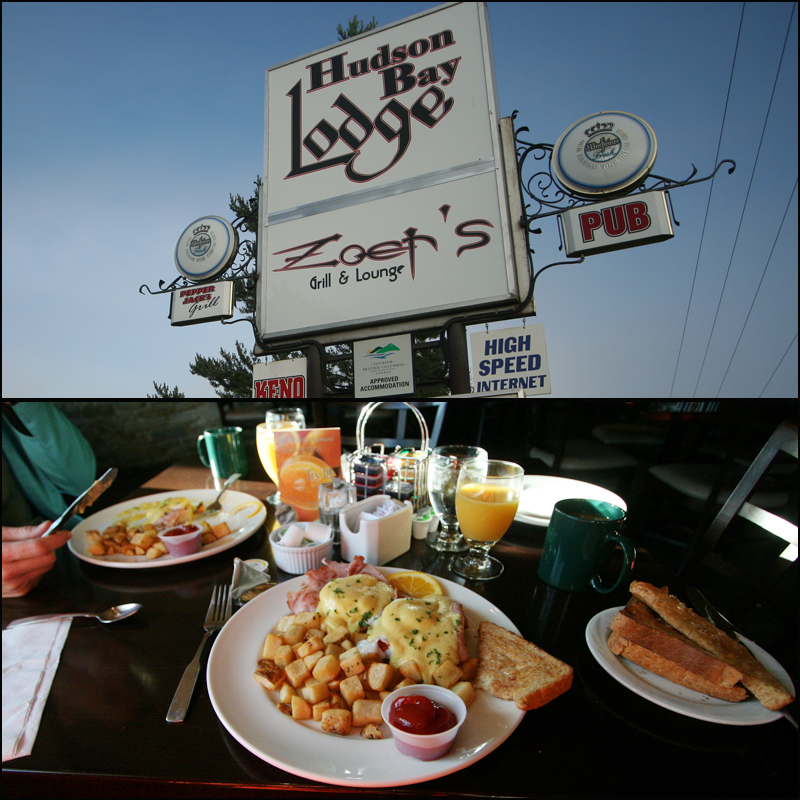 Before this we enjoyed breakfast at Zoers in the Hudson Bay lodge. 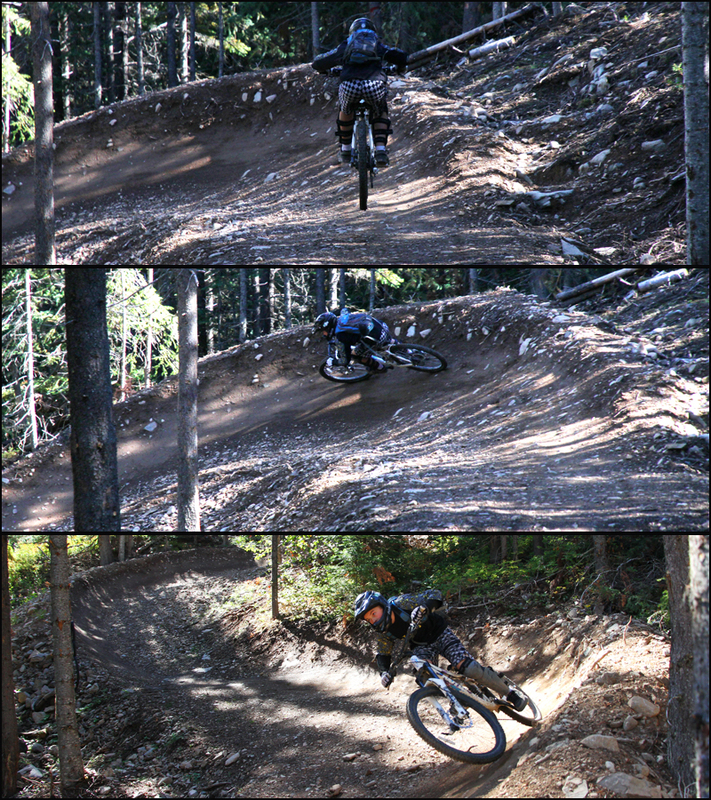 Then we were off to COB Bikes where we met up with Brian and Dave to head out for an XC ride on the Bluffs. 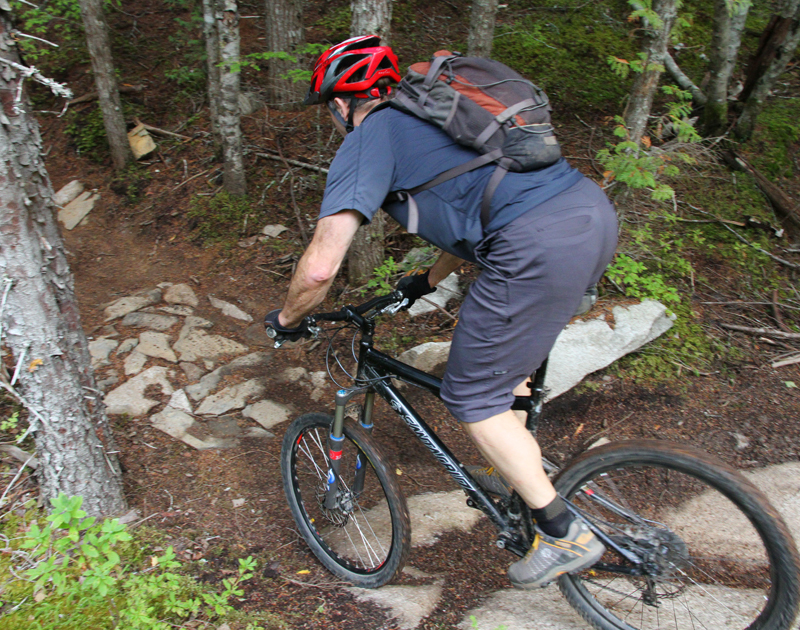 This area has many old trails that have been hiked and ridden for many years. Recently the SMBA has received funding to build more cross country trails that are also used by runners! One of the trails – the Shining! Gap or roll the entrance feature! Tuesday we took a much needed break and checked out another local popular restaurant Chatters. After this hearty meal I was feeling like riding! 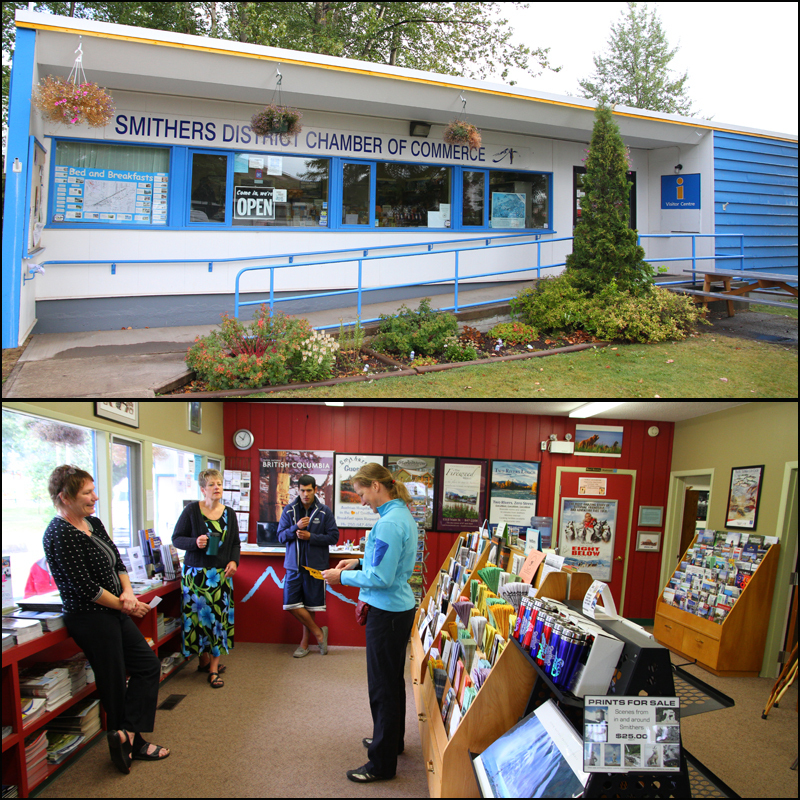 Today we checked out the Visitors Center to get information on other activities in the area. 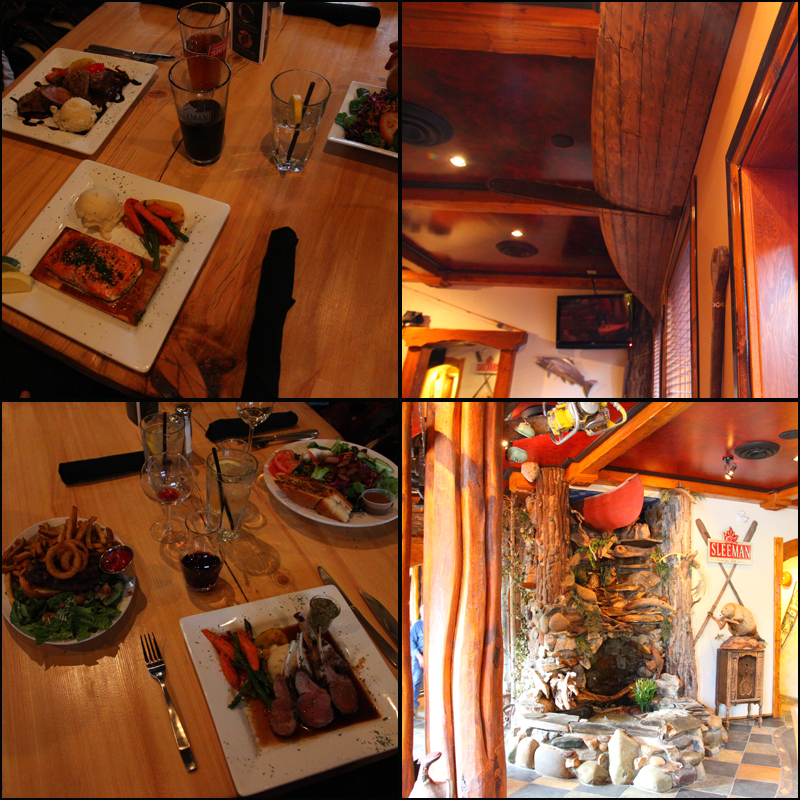 After spending most of the day resting we went to the Riverhouse for dinner and the newly renovated restaurant. The Aspen was so cool we had breakfast there the next day. 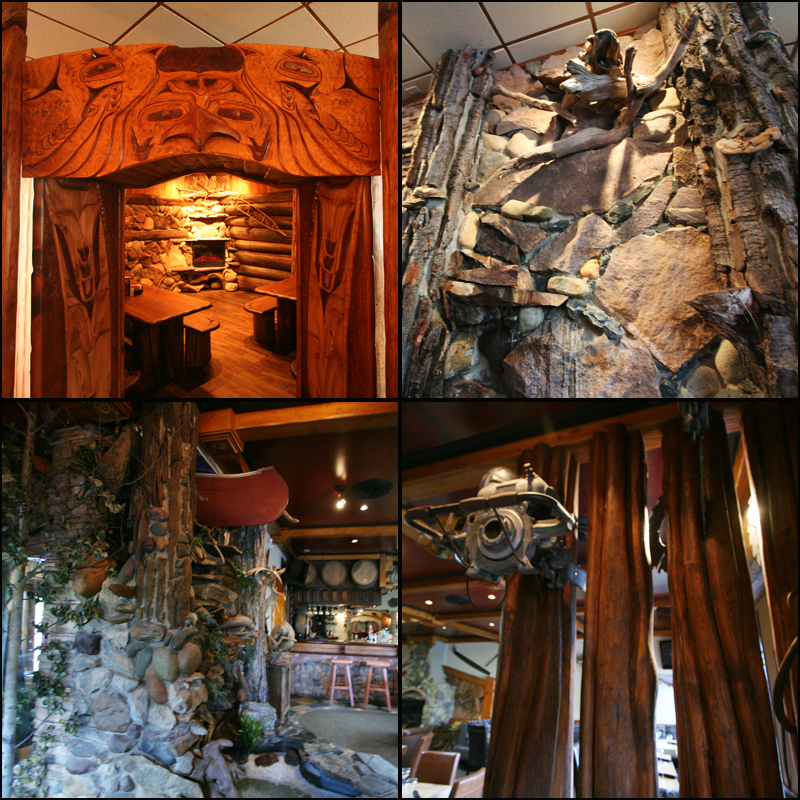 I guess the food was also so good we didn’t get a picture but we did get a picture of the cool smokehouse room in the corner and some of the other incredible craft work in the Aspen. 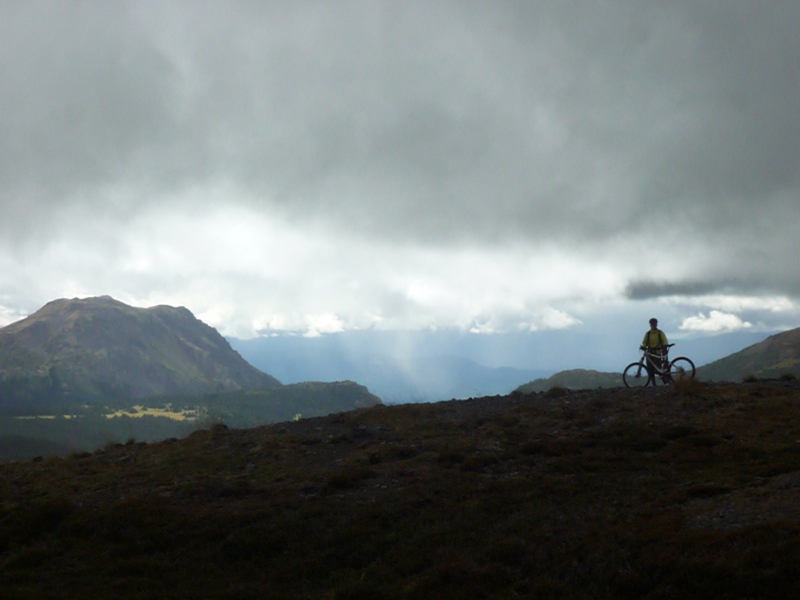 One thing about Central BC Riding is some days can be moody. 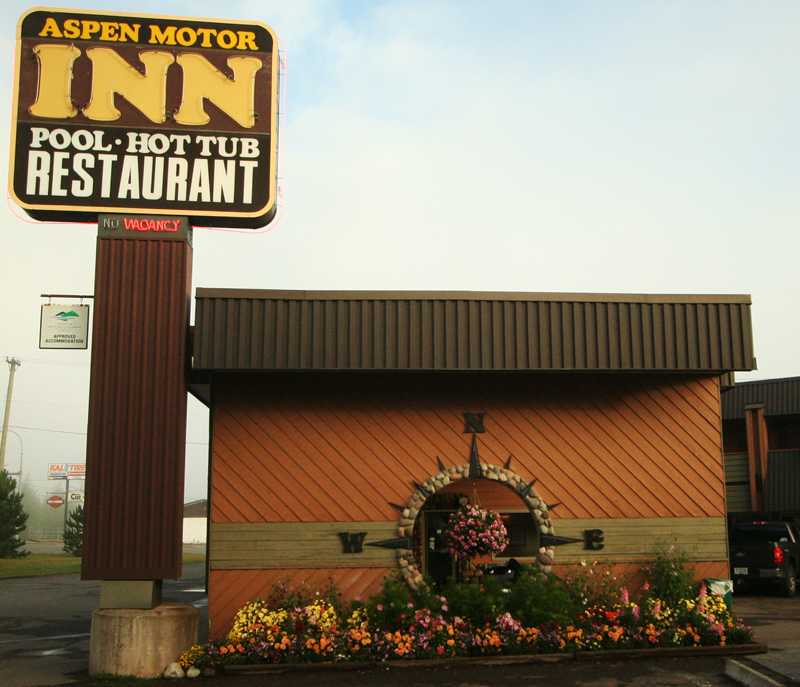 Good thing the day started out with a great breakfast at the Aspen! Fortunately you can always find someplace good to eat at the end of the day! The Steakhouse offered pasta, steaks and a buffet salad bar. If you’re hungry check it out! 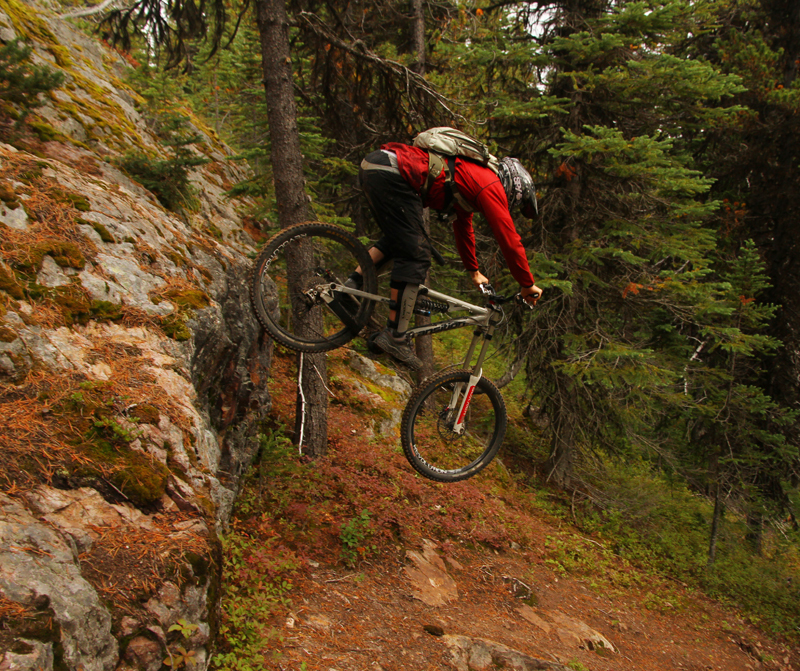 Smithers rides from Lee Lau on Vimeo. 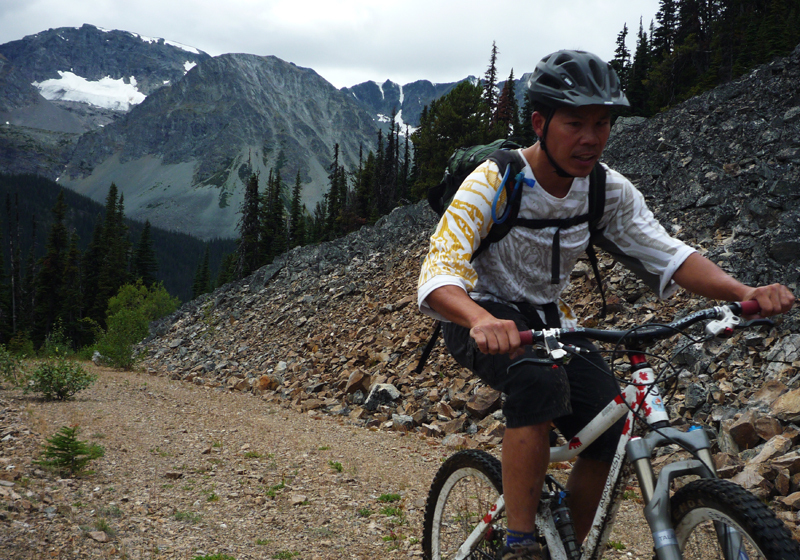 Cronin Trail – Hylands Pass – August 29, 2010 – short version from Lee Lau on Vimeo. 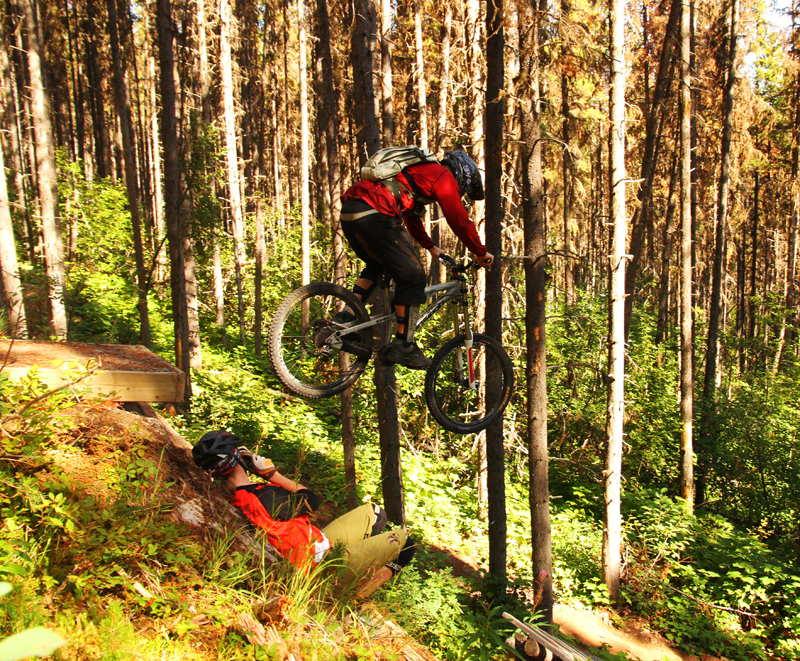 Smithers – Huckin Eh – August 29, 2010 from Lee Lau on Vimeo. 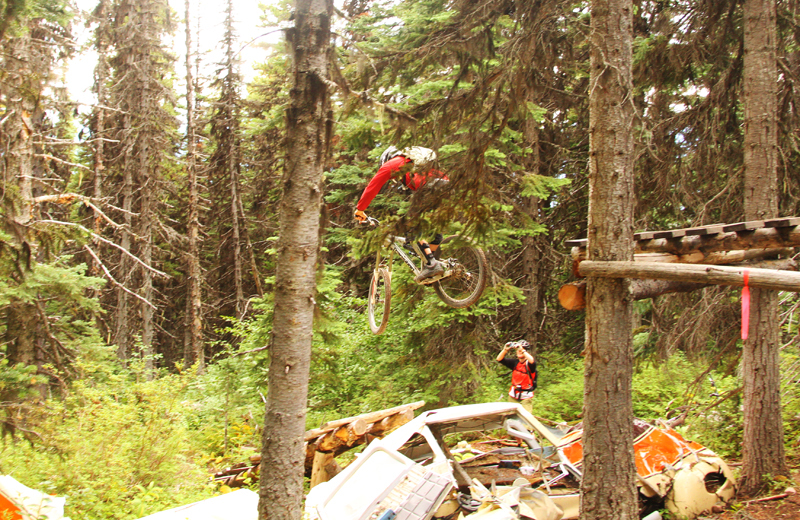 Pay Dirt – Smithers – August 29, 2010 from Lee Lau on Vimeo. Burns Lake is a small town along Hwy 16 known mostly for fishing. 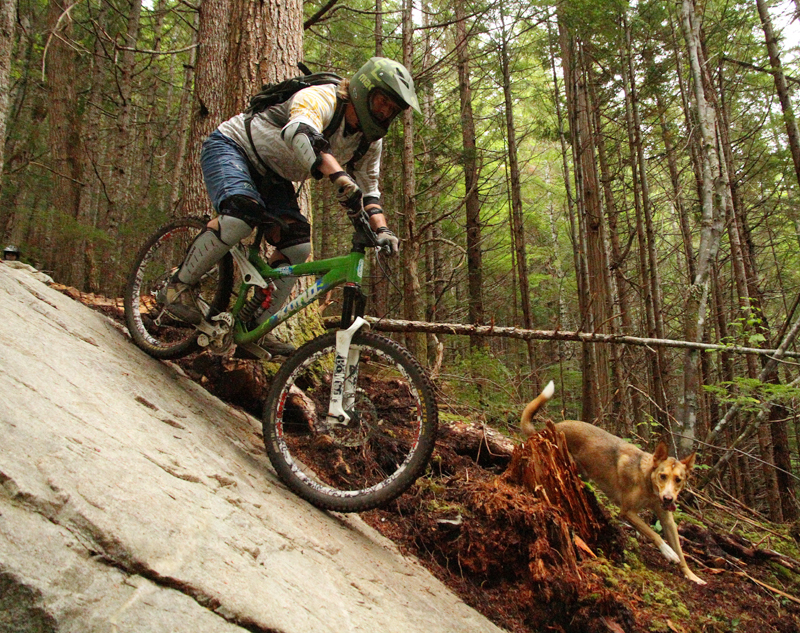 In 2006 two avid mountain bikers who relished the climbs up logging roads to descend down the hiking trails went to an IMBA sponsored mountain bike conference in Whistler BC. 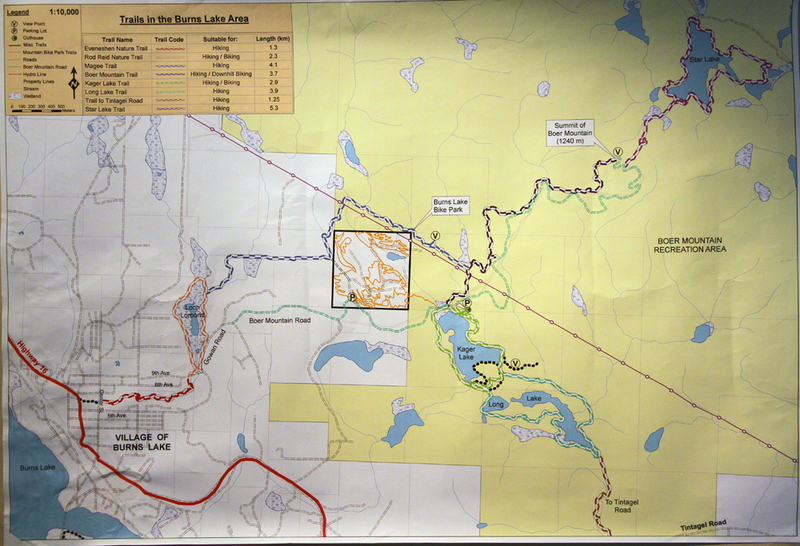 What they heard regarding land use issues and other user group conflicts pretty much didn’t exist in Burns Lake. 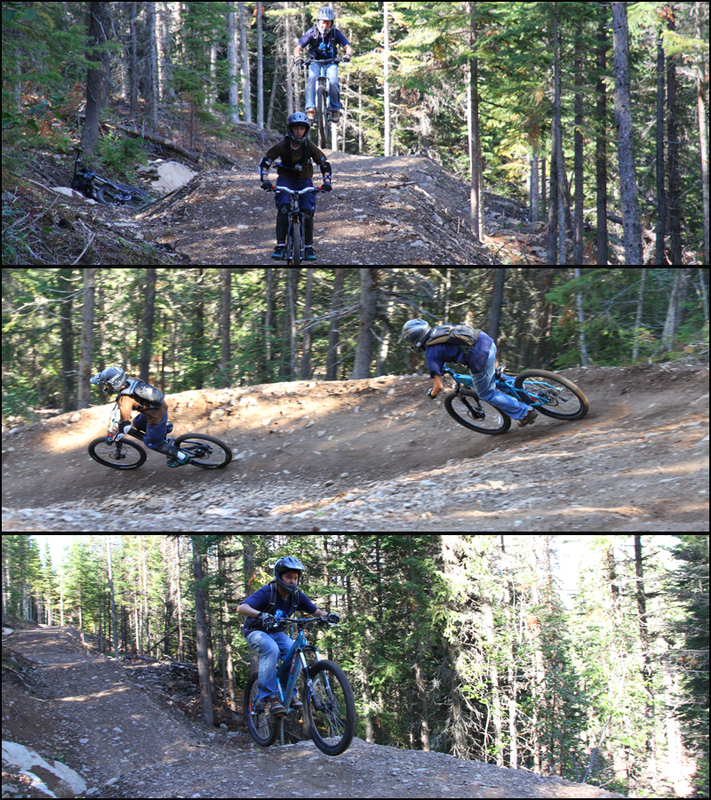 Playing hookie one day in the Whistler bike park they rode down the trail Heart of Darkness. Like a snail crawling on the edge of a straight razor there was born a dream. To some communities a nightmare. 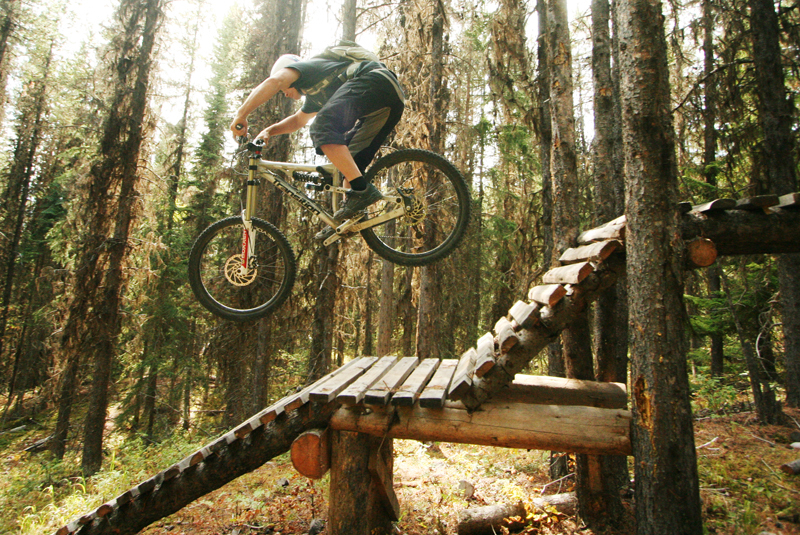 To build a Mountain Bike Park in Burns Lake. The area was identified – Boer Mountain. 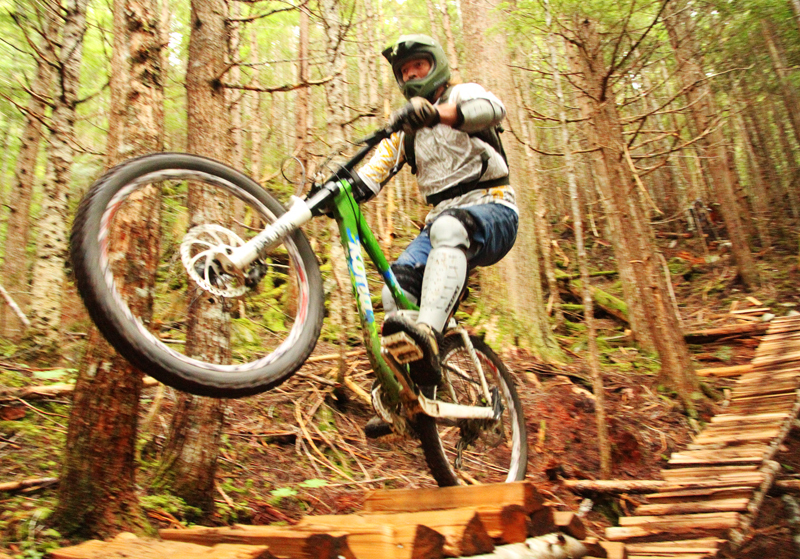 A budding trail building company was hired – Gravity Logic. With support from the provincial government the two trail Pigs Will Fly and Charlotte’s Web were born. Map of the area on Boer Mt. 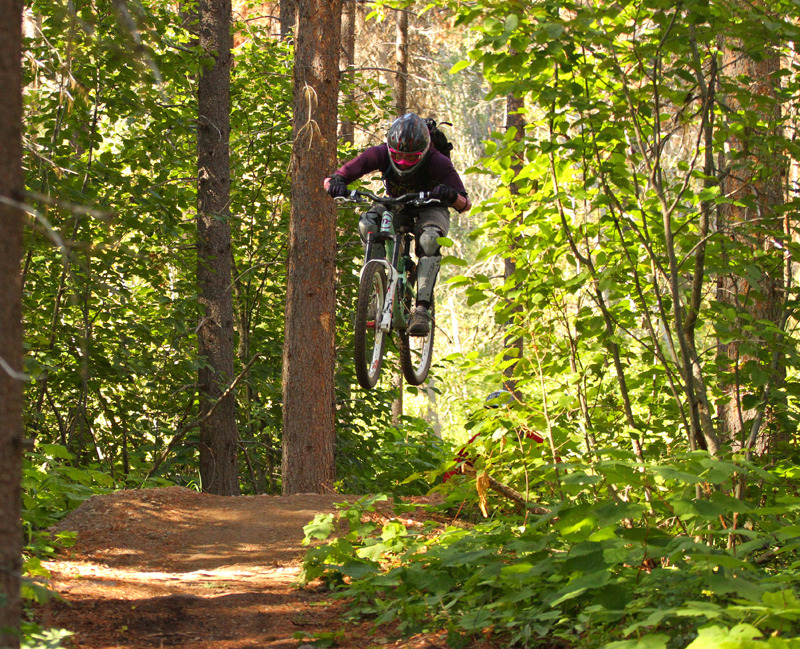 The Bike park is on the 160 Acres Burns Lake Community Forest Land. 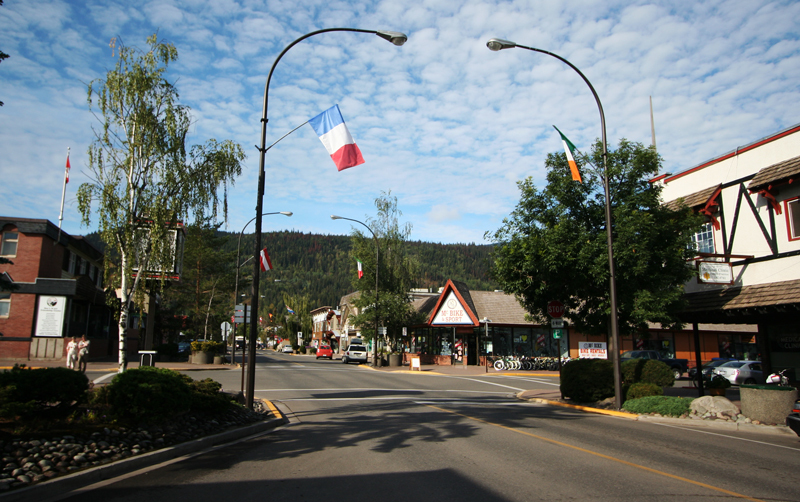 The surrounding 4000 Hectare Boer Mt area is crown land and managed by BC Provincial Government – Recreation Sites and Trails BC – under Ministry of Tourism Culture and the Arts. 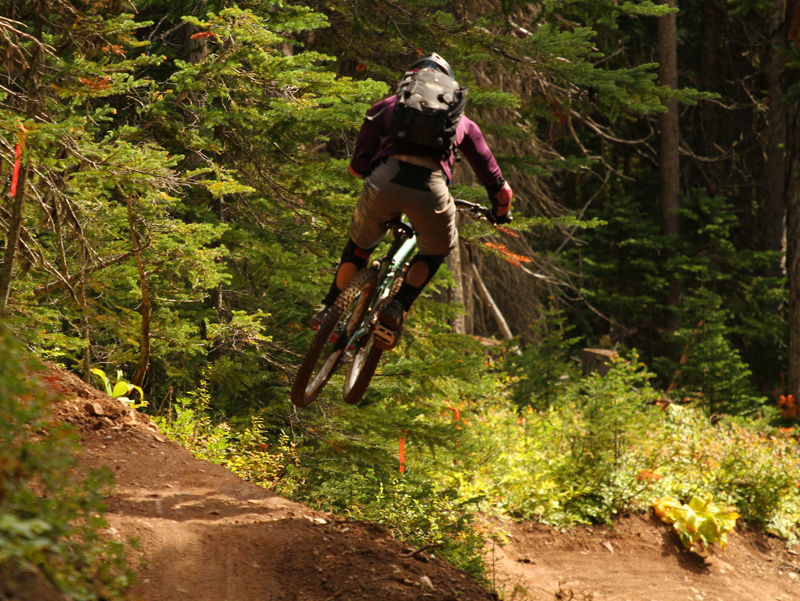 Boer Mt has an elevation drop of 300 meters making the potential of the area as great as the lower Whistler Mountain Bike Park area. 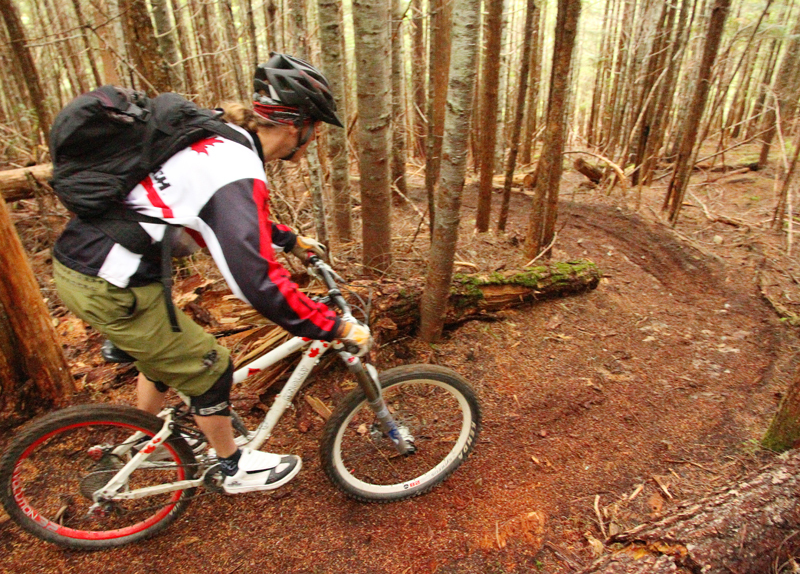 The trails wouldn’t be possible without government workers such as Kevin Eskelin that share the vision and see the potential for an area to include mountain biking – cross country and downhill, hiking, camping, fishing and just being out enjoying the great BC Outdoors. We were met today by Pat Dube and Dave Sandsmark members of the Burns Lake Mountain Bike Association who showed us the Burns Lake goods! Not bad for only doing this for a few years and as parents even! 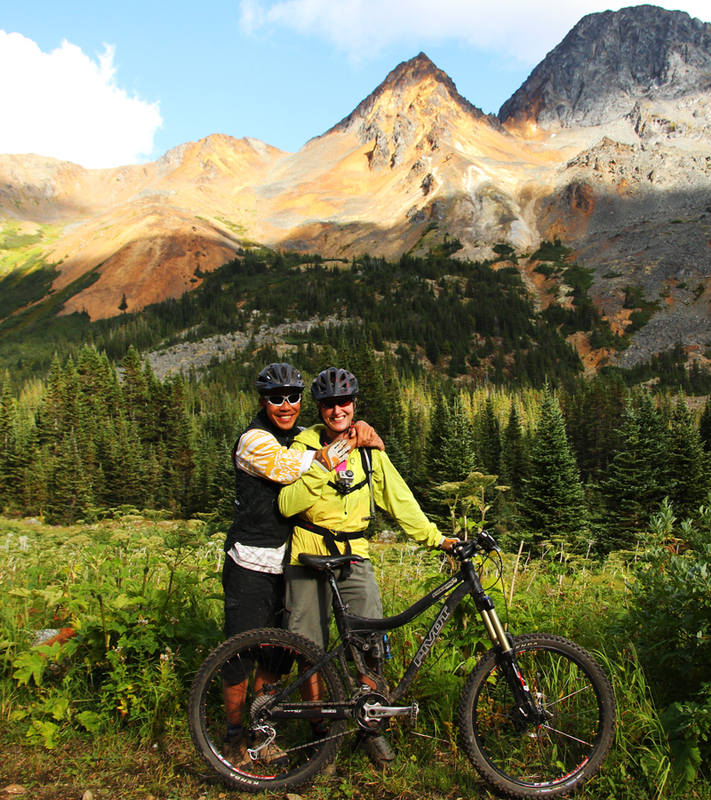 One of the great things about mountain biking is it brings the ages together. Pat can ride with his 12 year old son Andre and his friends Pierce and Alec. Just the evening before Dave and Pat had a trail day on this section. This is another great thing about this community. 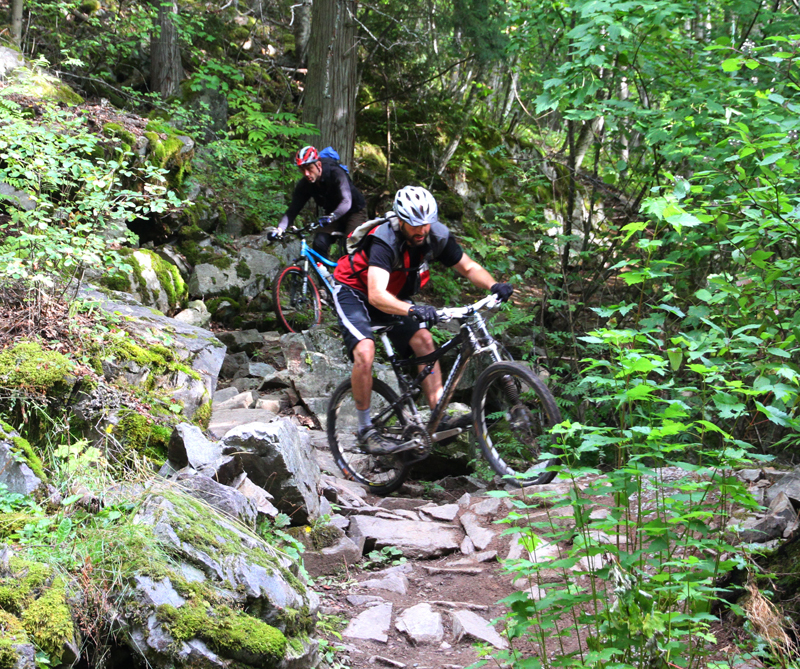 On one of their weekly rides they will stop at a section to do some work on the trail. 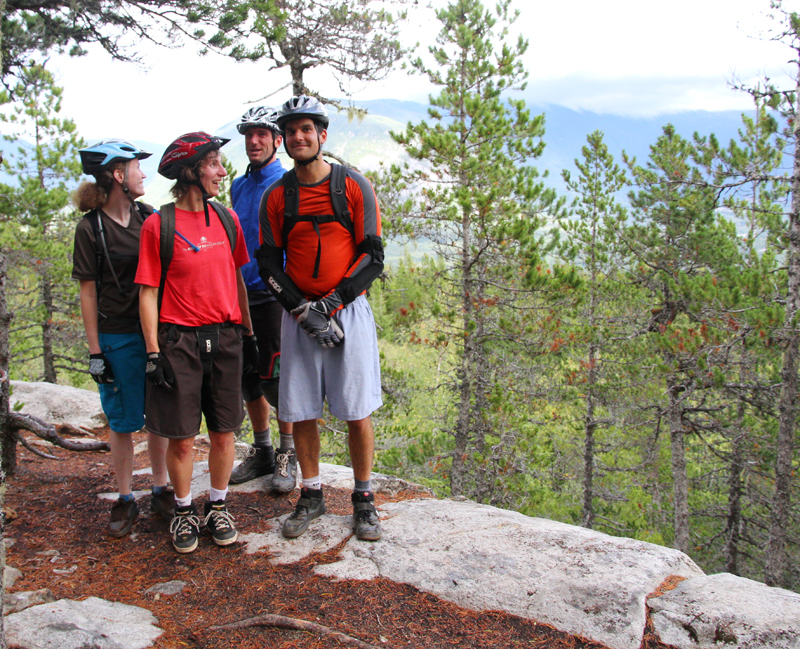 This is a great way to build a sense of ownership on the trail and create stewards for life. After the ride a short distance from the shuttle parking lot is a camping area and this lake and dock. We were in Terrace back in 2001. 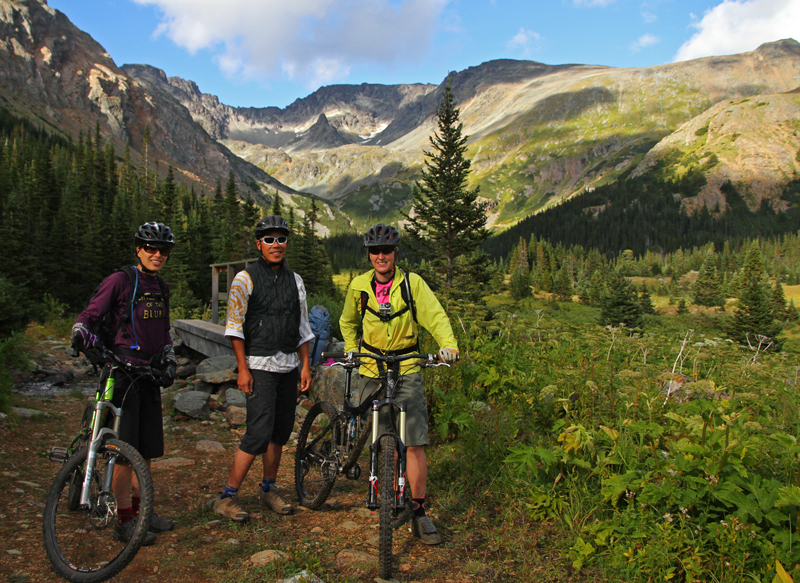 We rode Copper Mountain and those memories are what brought us back. 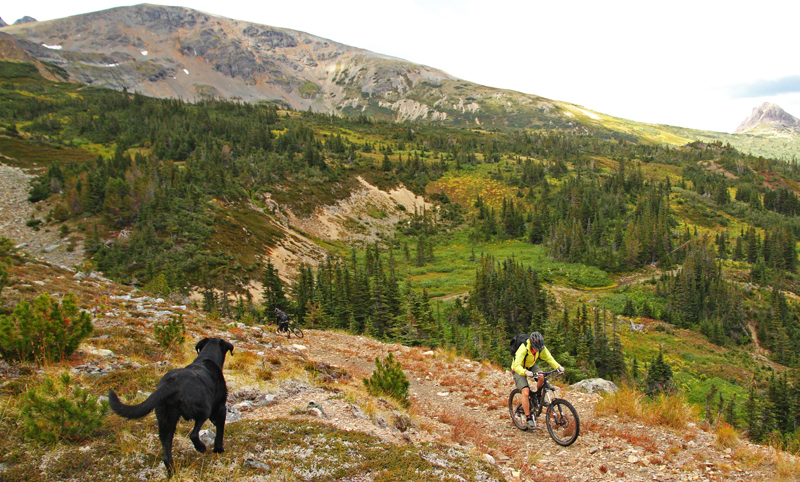 Since then a growing mountain bike community has maintained and built more trails on Copper Mountain. As well another area, Terrace Mountain, has been developed. 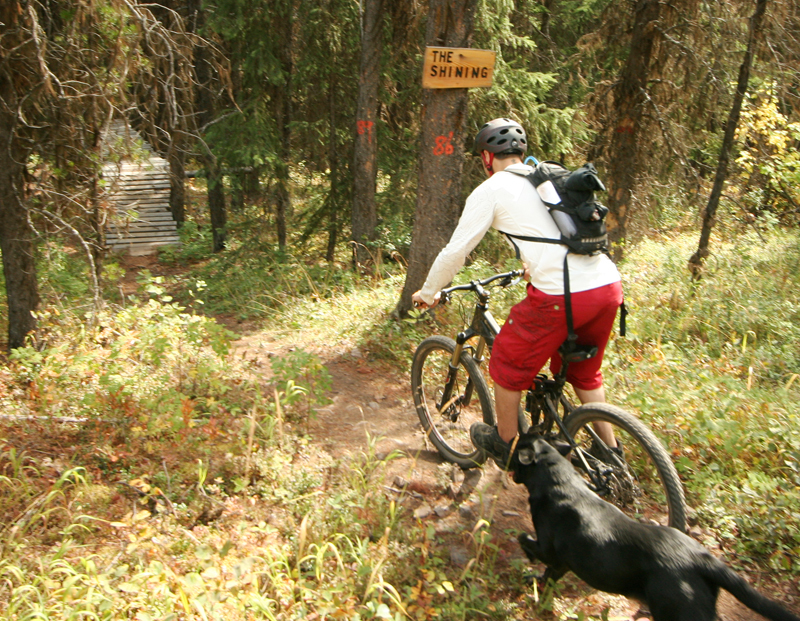 The most popular mountain bike trail on Terrace mountain is the Flathead Trail built in 2006. 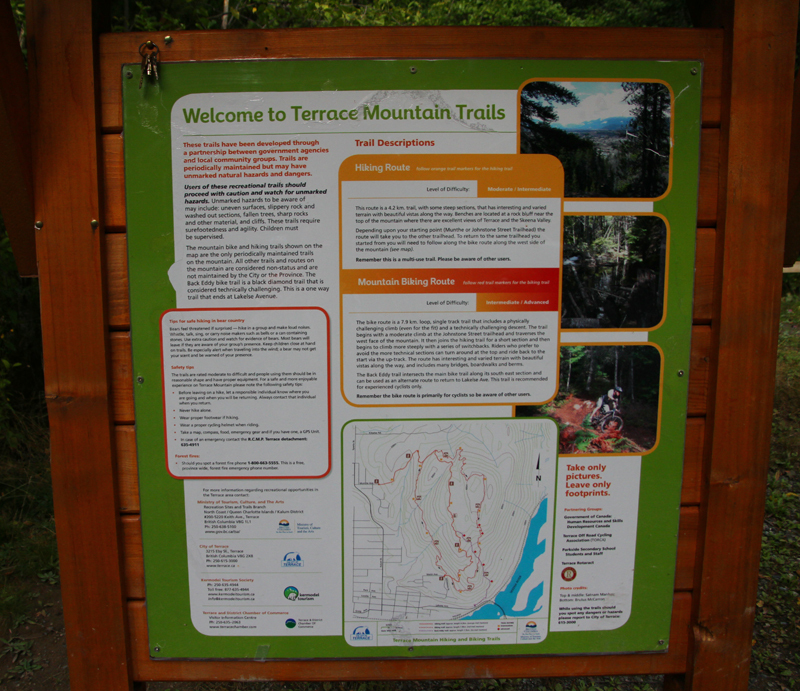 Other trails on Terrace mountain include Back Eddy, Terrace Mountain hiking trail. Back Eddy is one of the older mountain bike trails. 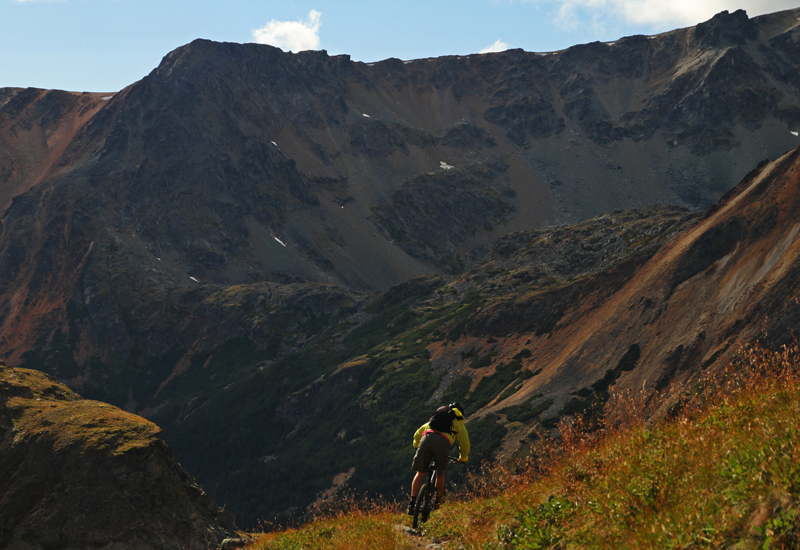 Copper mountain currently has 18 recognized trails, most of which are unsanctioned with structures. They are steep and technical. 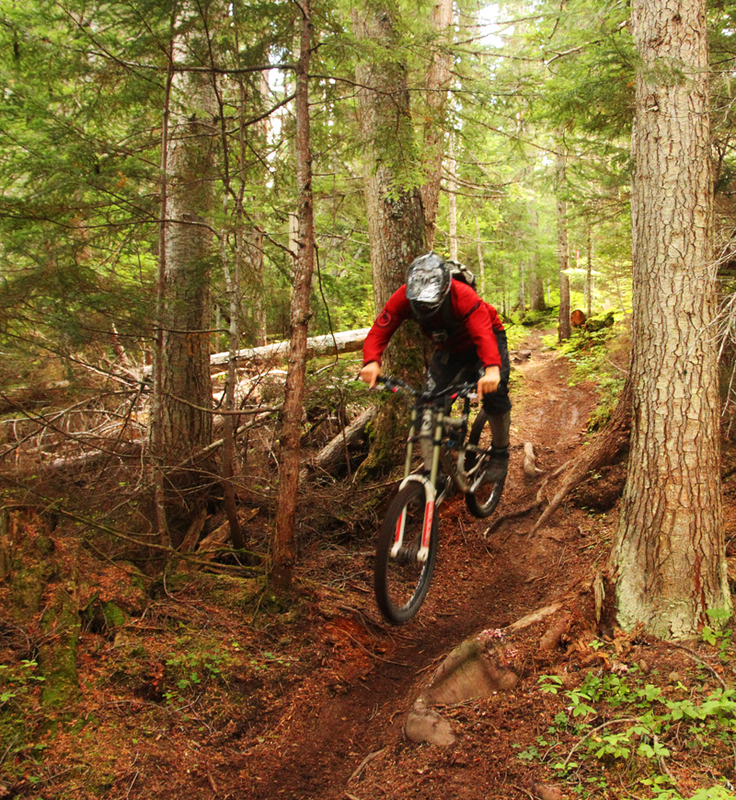 Three are approved, Packhorse, Lucky 7 and Lick Bike, these trails contain no structures. 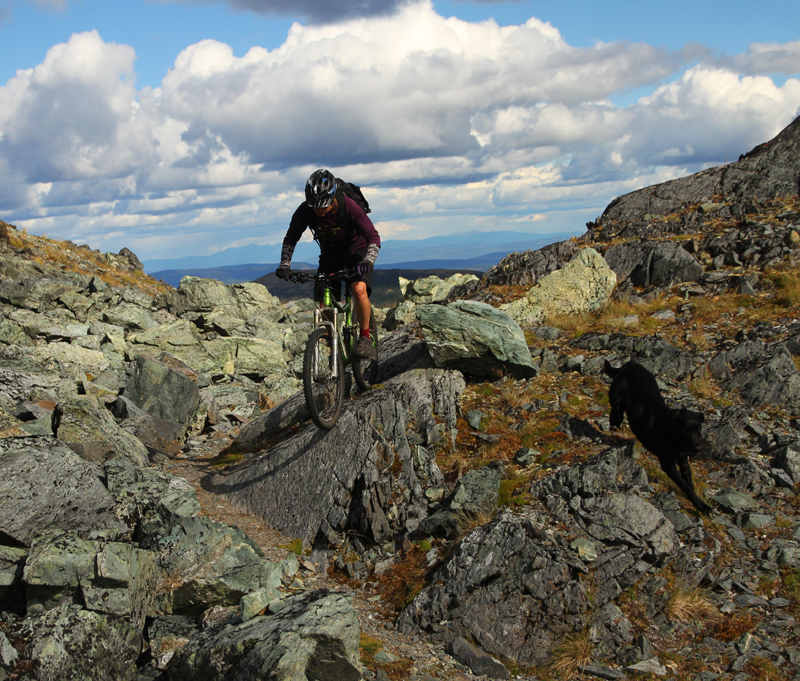 The Terrace Mountain Bike Association does not have a website, but you can find them on Facebook. 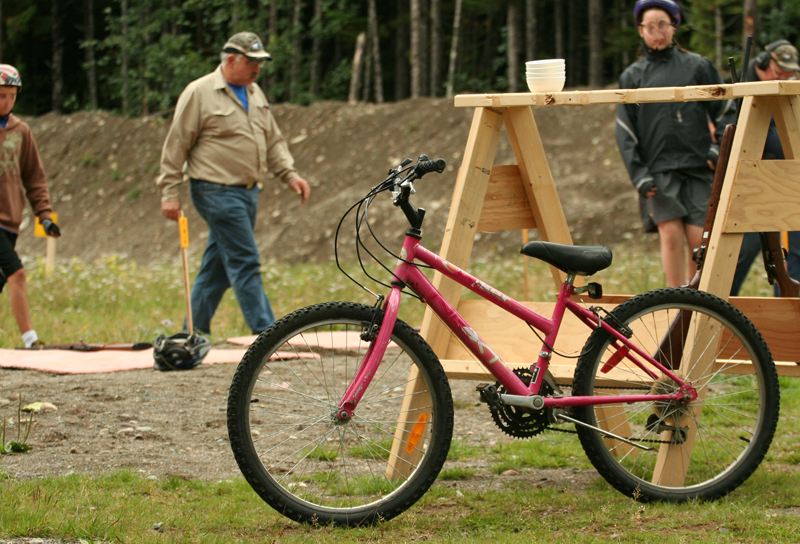 When we arrived we were told that the local Terrace Rod and Gun Club was putting on a bike biathlon. They were supposed to put on ski biathlon last year but it was cancelled and turned into a run due to lack of snow. The popularity of that event gave them this idea. It was fun! 29 participants, half of whom were kids, rode one short bike lap, shot 5 rounds with a 22, rode again, shot another five rounds and rode one more time. 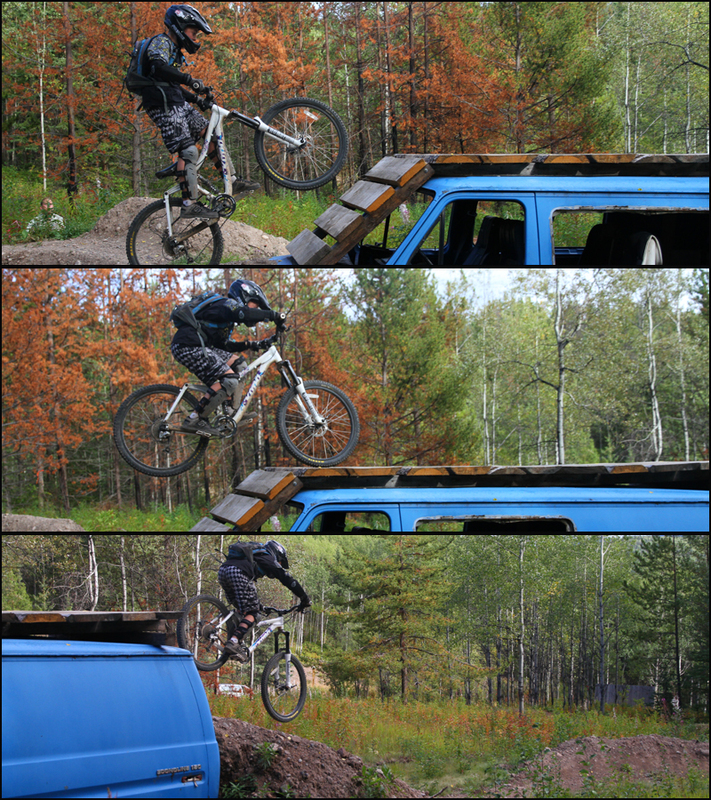 Kids practice with the Pinkbike! About 29 people participated in this event, ~1/3 were kids! Bodes well for the future of cycling in Terrace. Trail head for Terrace Mountain. You can ride here pretty much from anywhere in town. 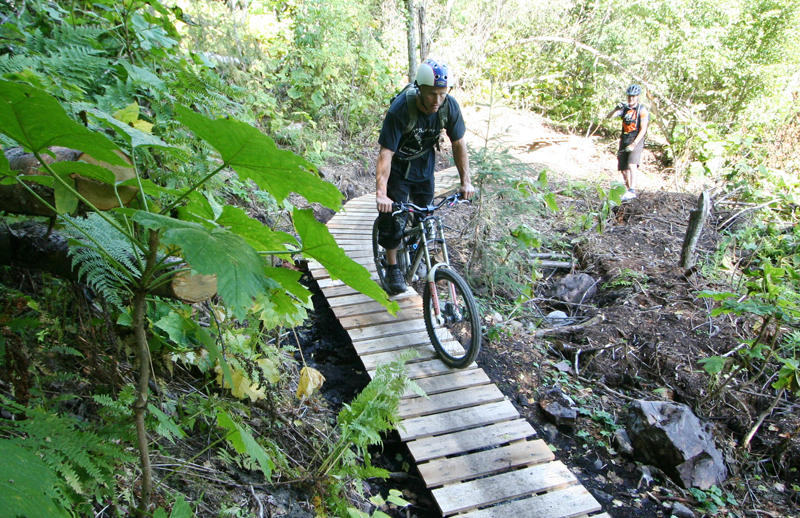 Great little crosscountry network of trails maintained by the Terrace Mountain Bike Association. Then we went to Copper Mountain. Our first lap we rode up Packhorse and down Lucky Seven. This trail is three years old and the locals think its getting eroded. Once at the bottom we met up with Wade Muchowski one of the local builders. With him and his crew we did three more shuttles to get a good taste of Copper mountain steep and deep! Helen on the roller coaster. Hawk Air has regular flights nto Smithers and Terrace that will get you there in two hours. Unlike the mayhem of the Vancouver Terminal, flying with Hawk Air out of the South Terminal is a treat! We were at the airport 30 minutes before our plane left. One nice thing about this flight is going over the Coast Mountains which are beautiful and incredibly glaciated. 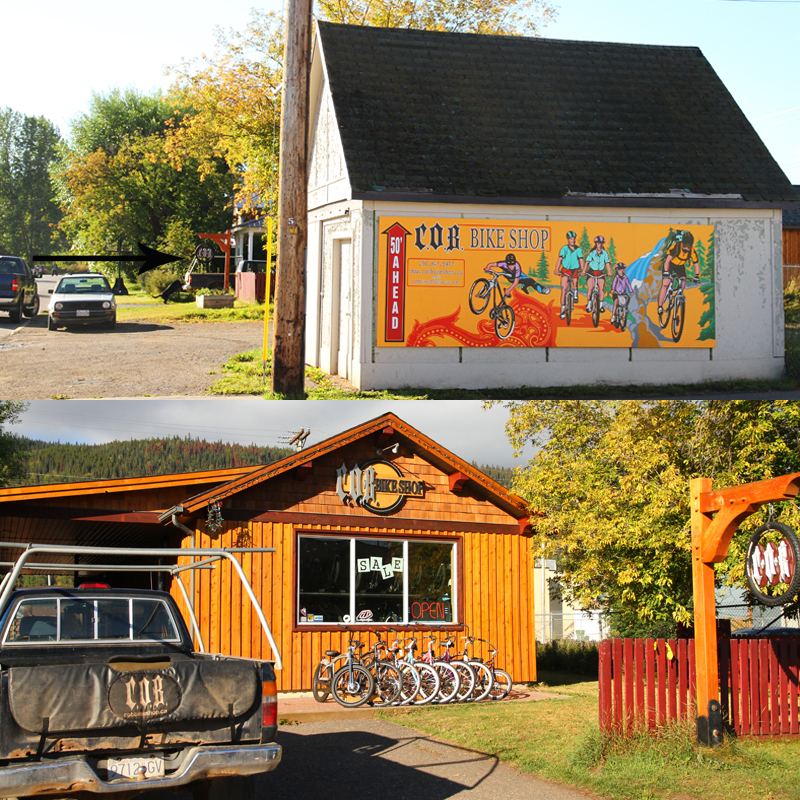 We sent our bikes to COB Bikes via Greyhound who were incredibly helpful with trail information and any others things we needed. 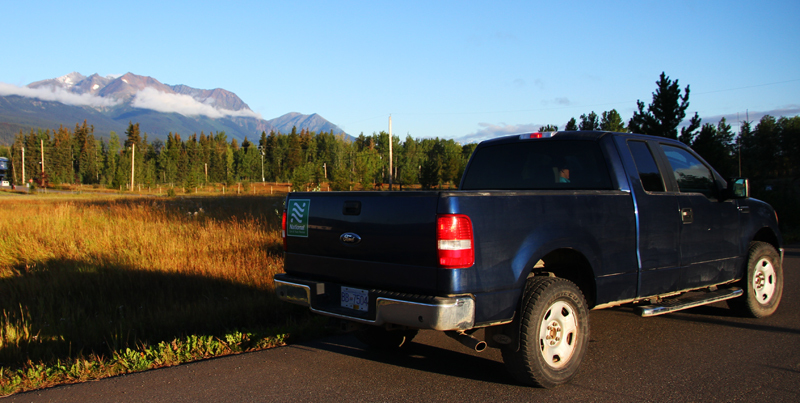 Once in Smithers we rented an F150 from National Car Rentals whose desk was right beside the baggage pickup. 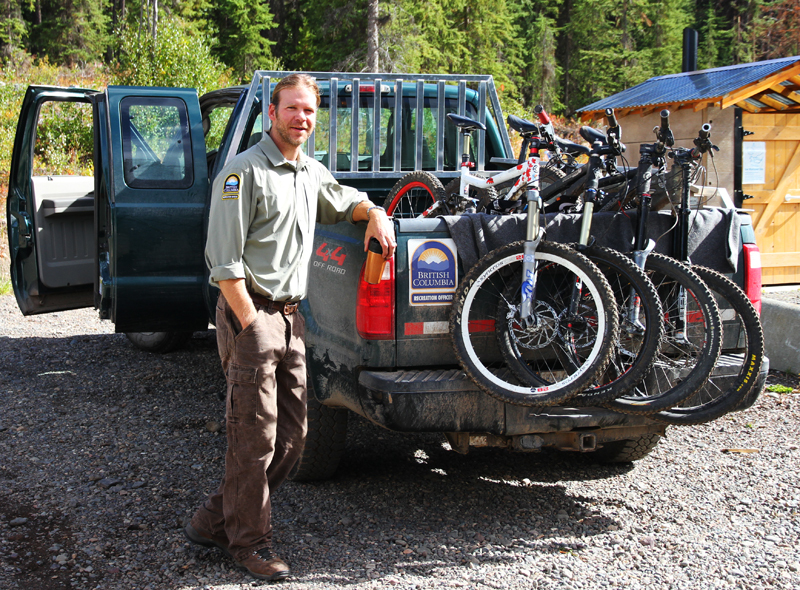 The truck offered great convenience in transporting the bikes to the trails. Also of note, if you travel to central BC in the winter National Car Rentals has winter tires on their rentals. You could also drive to the 1100km from Smithers to Vancouver in about 18 hours. George, Burns Lake, Terrace and others area along the route. 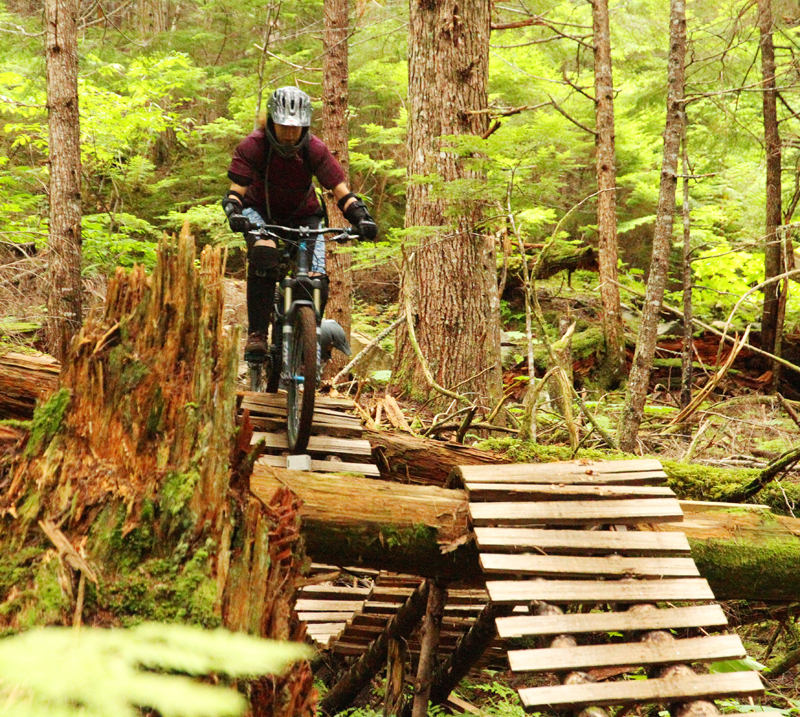 One could even take the Ferry from Prince Rupert to Port Hardy and include an island trip and riding in the Comox Valley. 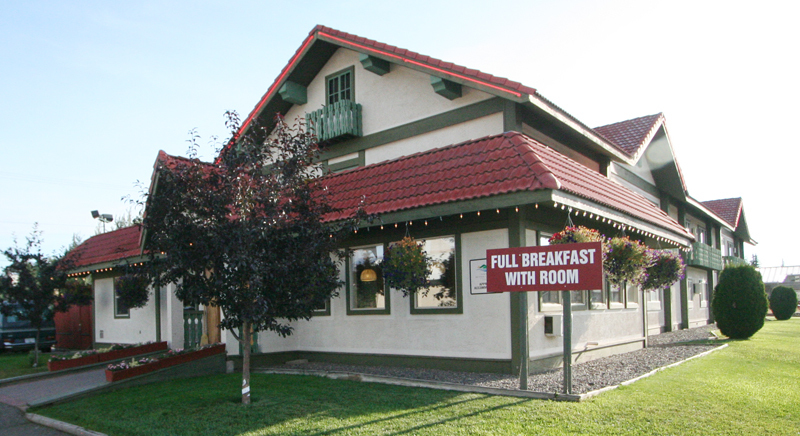 Storksnest Inn offers hotel style accommodations with a complimentary breakfast. 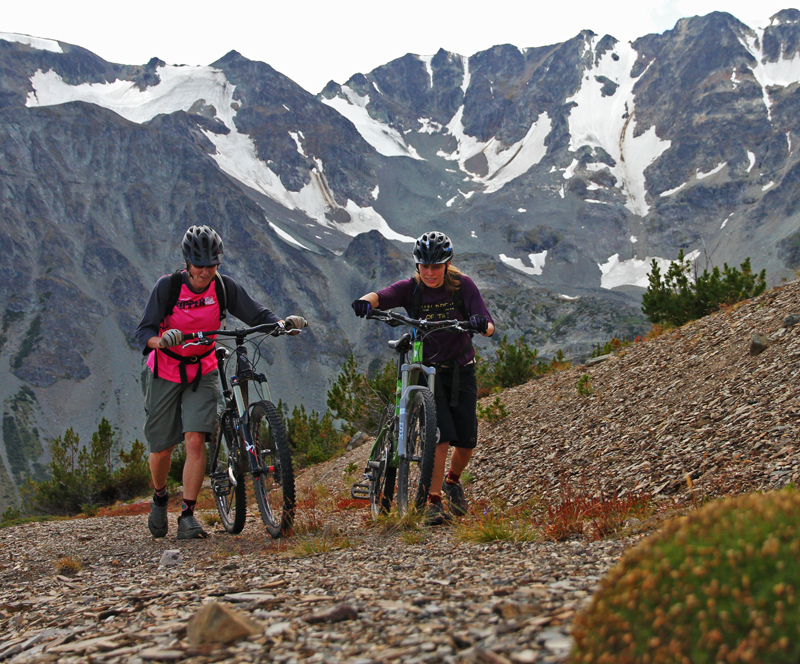 They have secure bike storage, wireless internet and are walking distance to town. 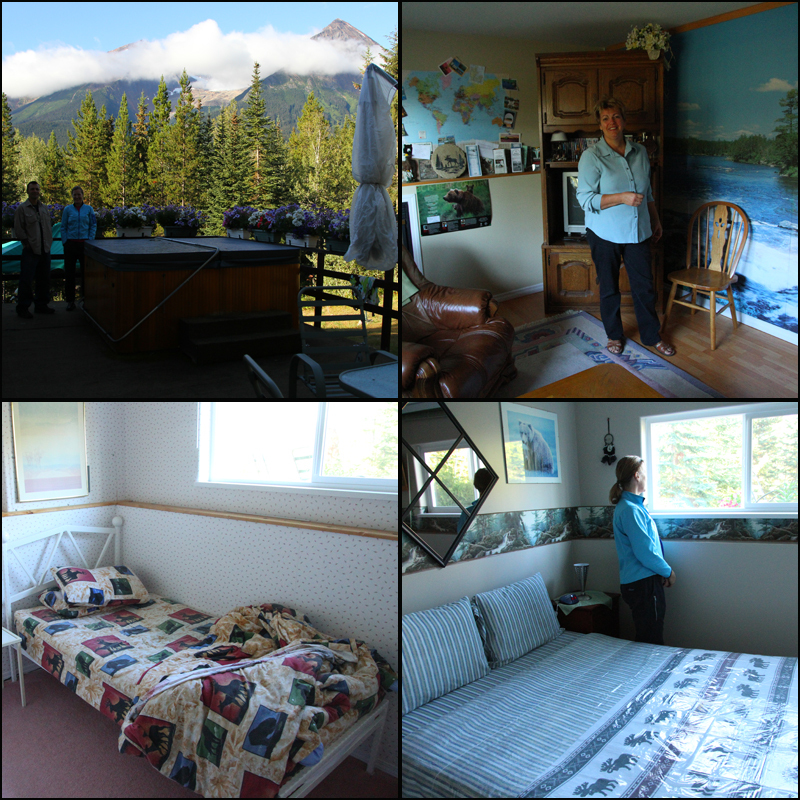 For a more home style atmosphere the Silvern Lake B&B is an option that is a bit further out of town with great views of the Kathlyn Glacier and great hospitality. 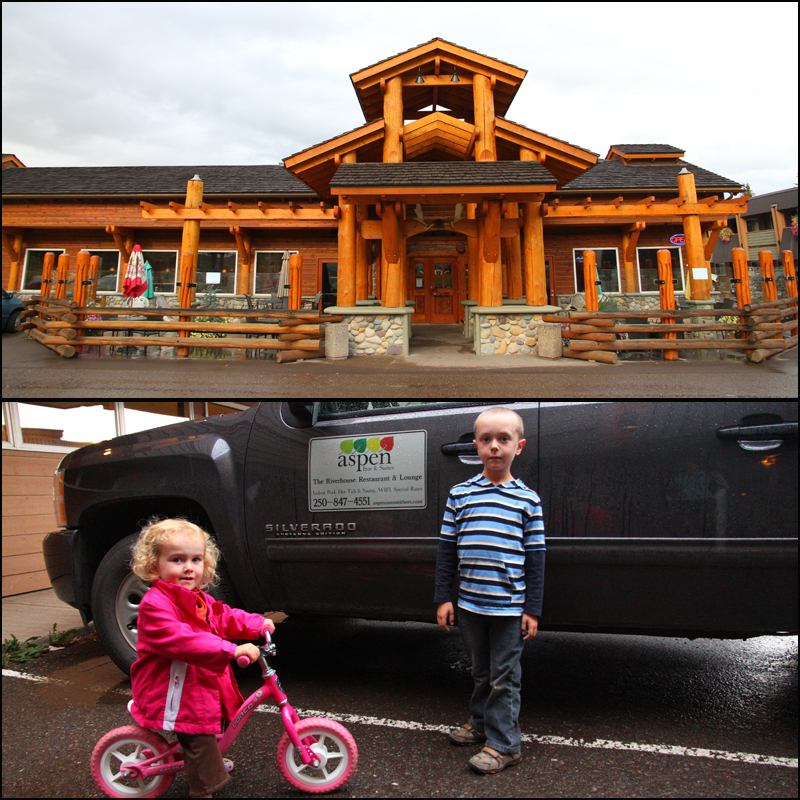 Aspen Motor Inn also offers secure bike storage, rooms with kitchenettes and their newly renovated Riverhouse restaurant. Definitely worth the visit even if you don’t stay here. 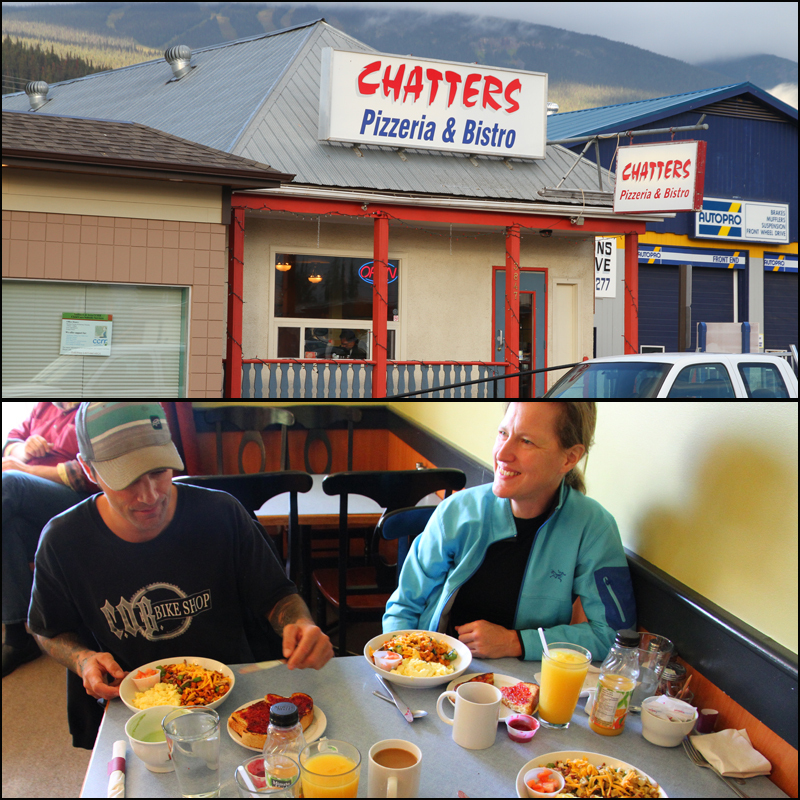 Mountain bikers breakfast at Chatters on 4th Ave. Also serve lunch and Pizza for dinner. CHECK OUT THE AMAZING CRAFTMENSHIP INSIDE. 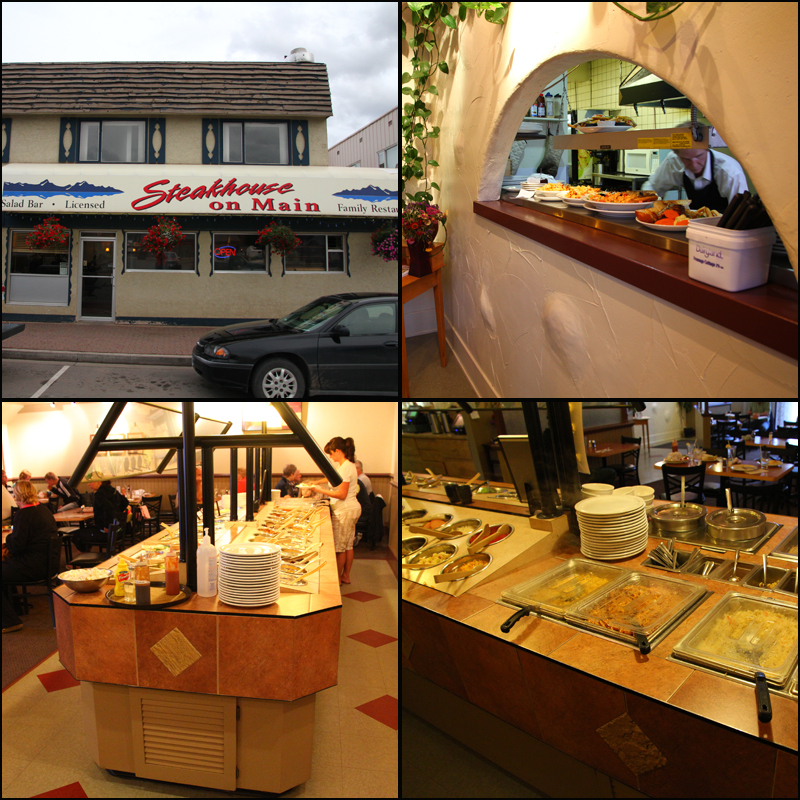 Steakhouse on Main has a Buffet, Grill and serves big servings! Breakfast is also offered at Zoers. The main pub in town is the Alpenhorn. Center for maps and information. Golfing – one championship course, one par 3. Park Building at the junction of Main St and Highway 16. 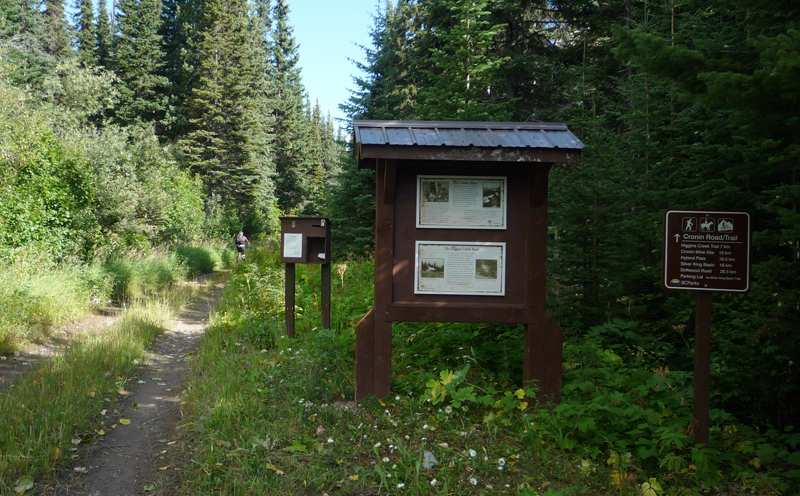 Tour of Telkwa High Road – including Driftwood Canyon Fossil Beds. 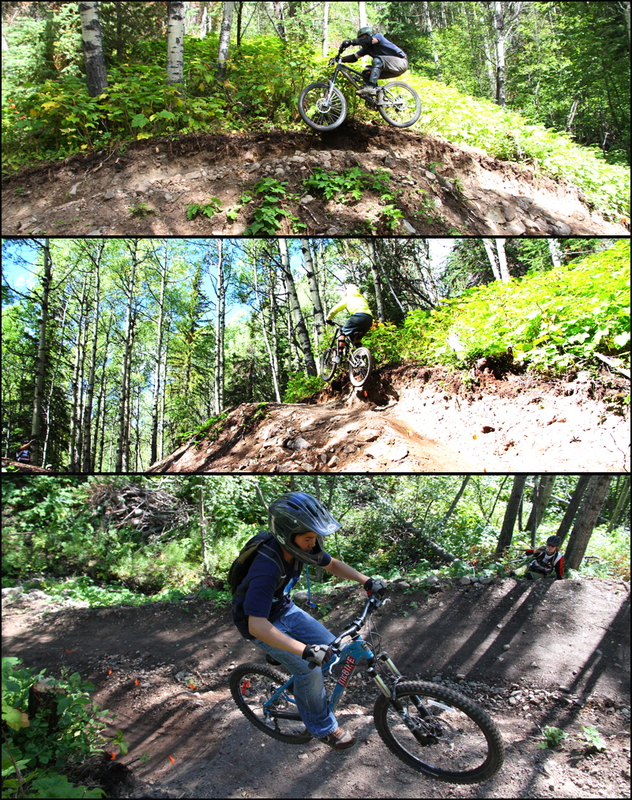 Hiking in the Babines as well as biking. season, so the rivers get busy. McBike and Sport Also a McBike in Terrace. 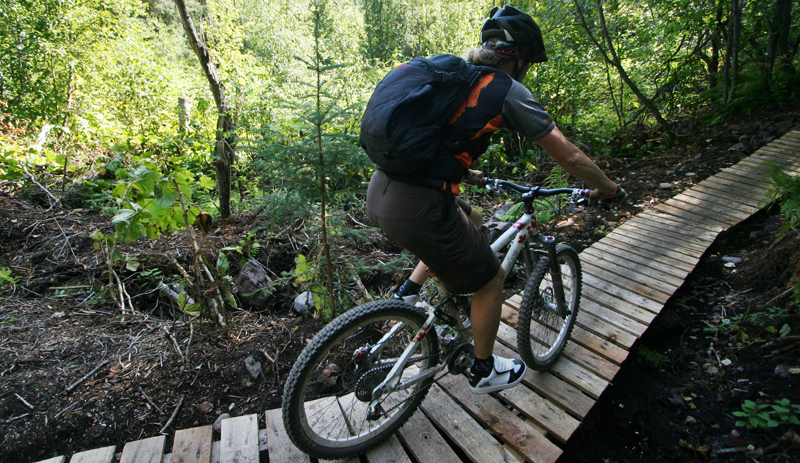 This entry was posted in 2010, bike and tagged Burns Lake, Smithers, Terrace. Bookmark the permalink.